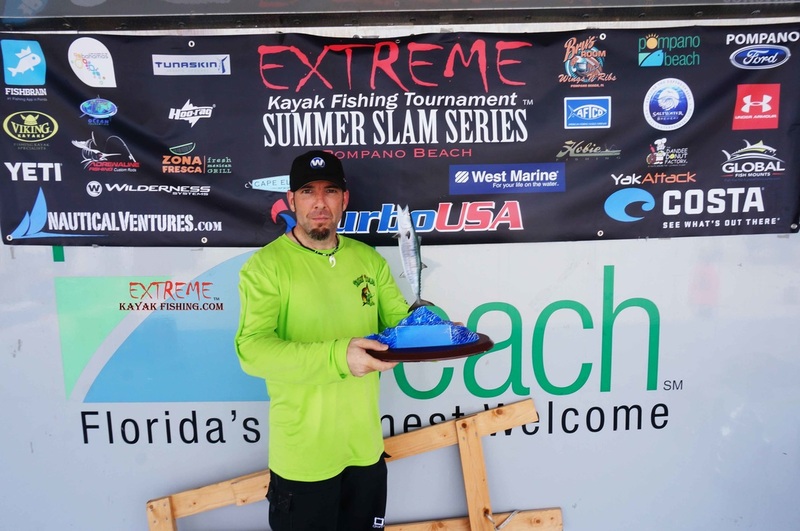 Greg Nolan - Winner of the 2018 Summer Slam Series and the RAILBLAZA/TurboUSA Championship Ring with 40.3lbs total in the series. 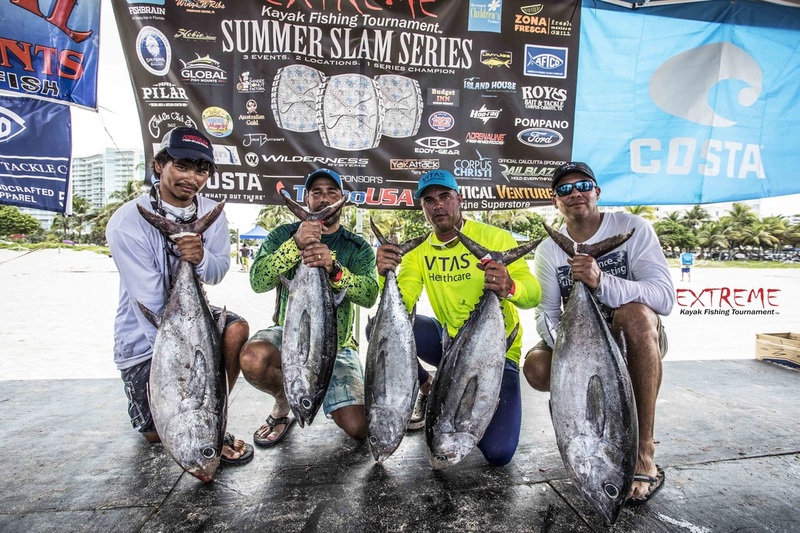 Jacksonville Angler Franco Natividad wins the #EKFT Championship Billfish Ring!! 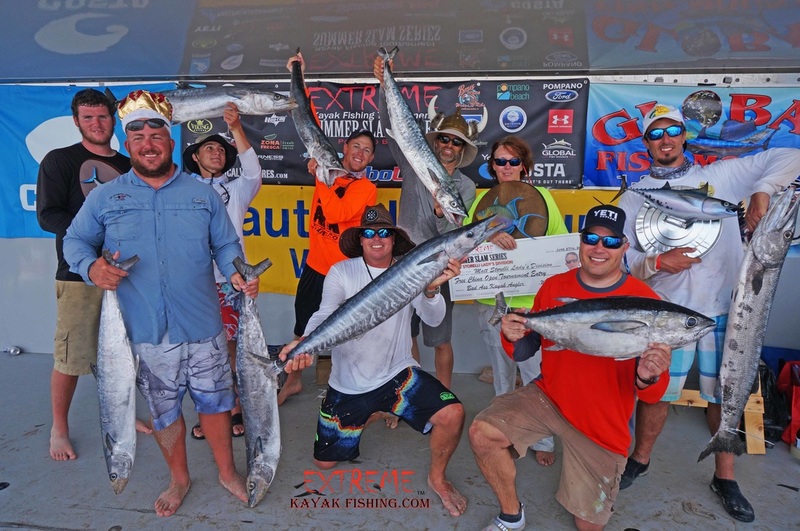 1st – John McKroid total weight (101.7lbs) - $5,000.00 (Turbo USA) & Trophy from (Global Fishmounts) and $1,400 RAILBLAZA Kingfish Calcutta and $500 (YakAttack) Wahoo Division. 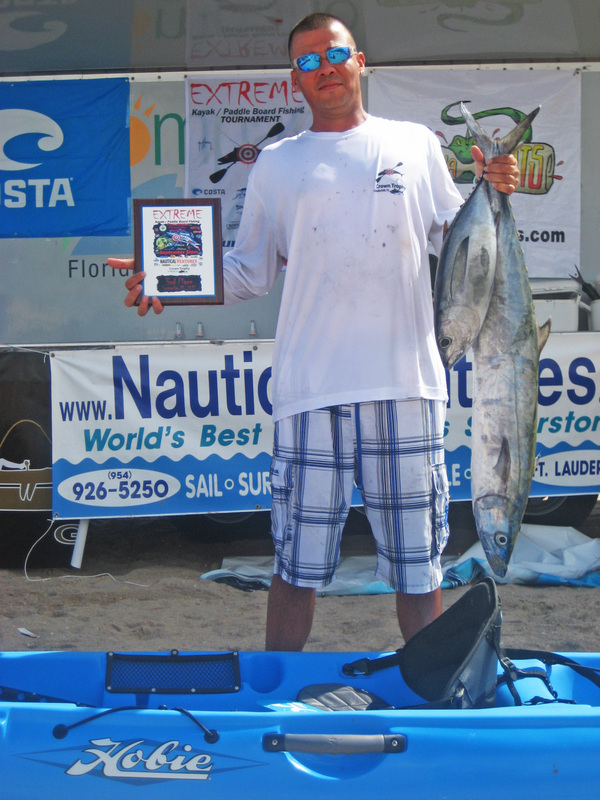 1st - $5,000.00 (Turbo USA) Robinson Rodriguez 67.2 lbs. 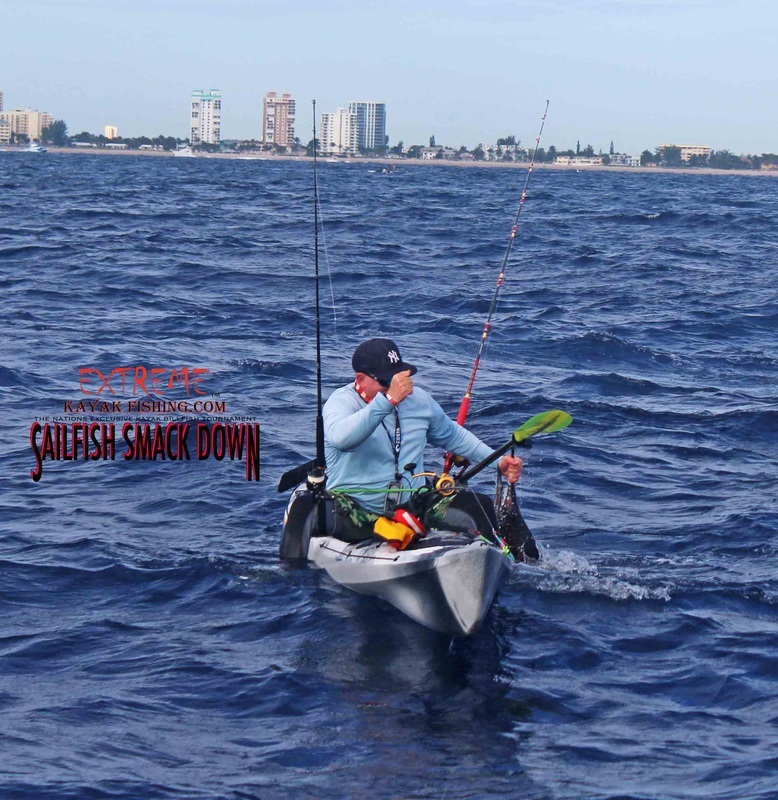 2nd - HOBIE OUTBACK KAYAK (NAUTICAL VENTURES) Carl Slagle 52.3lbs. 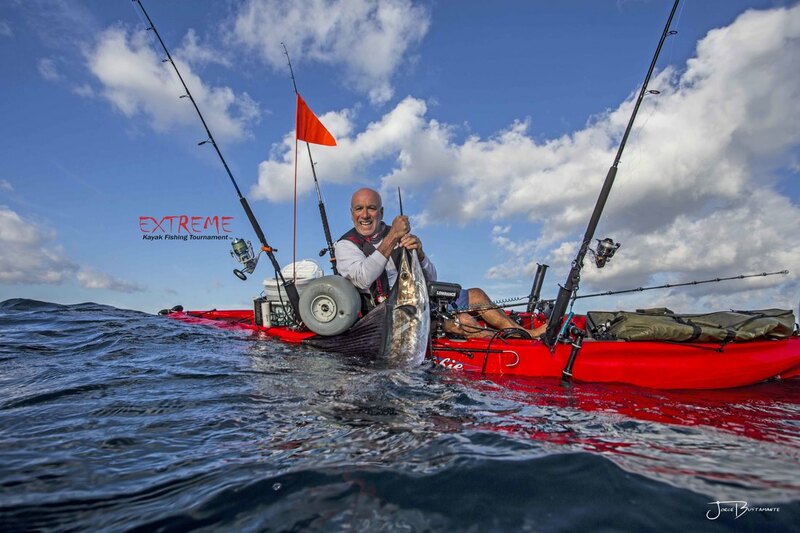 3rd - HOBIE REVO KAYAK (NAUTICAL VENTURES) William Centrone 14.3lbs. 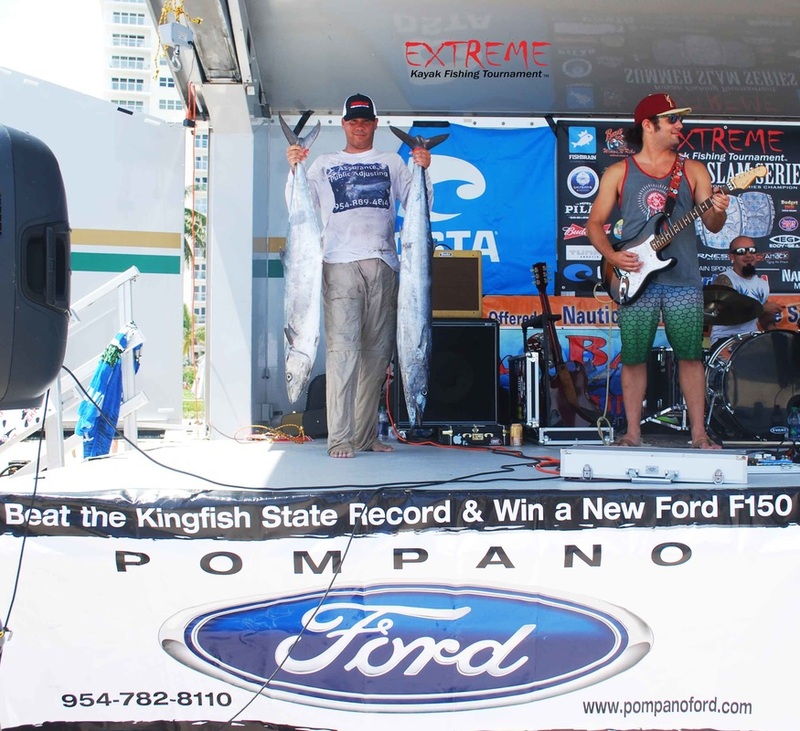 4th - $1,000.00 (POMPANO FORD) Brandon Nodal 13.2lbs. 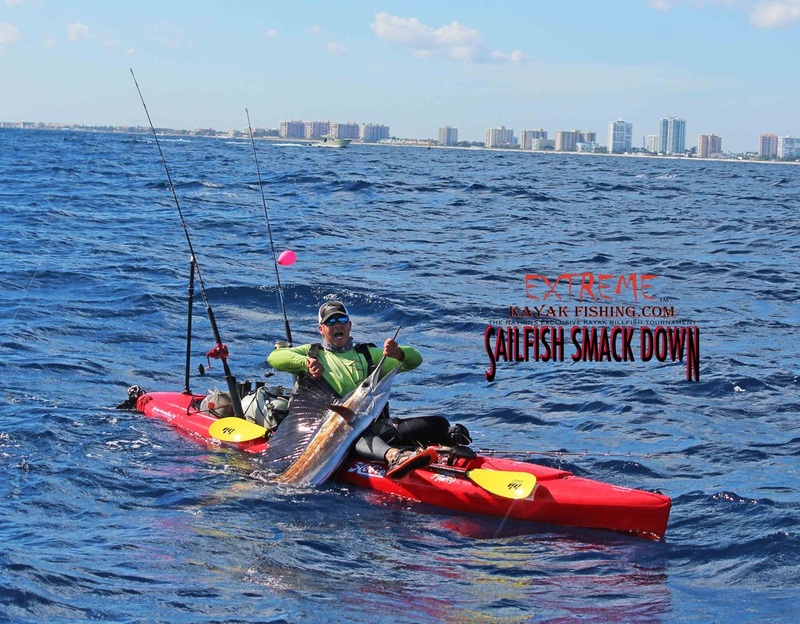 5th - EDDY GEAR STINGRAY KAYAK (Worth $750) Carl Torresson 12.7lbs. 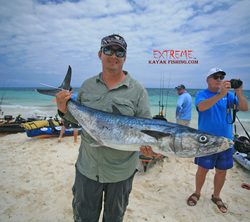 7th - COSTA Glasses worth $250 David Gauzins 10.4 lbs. 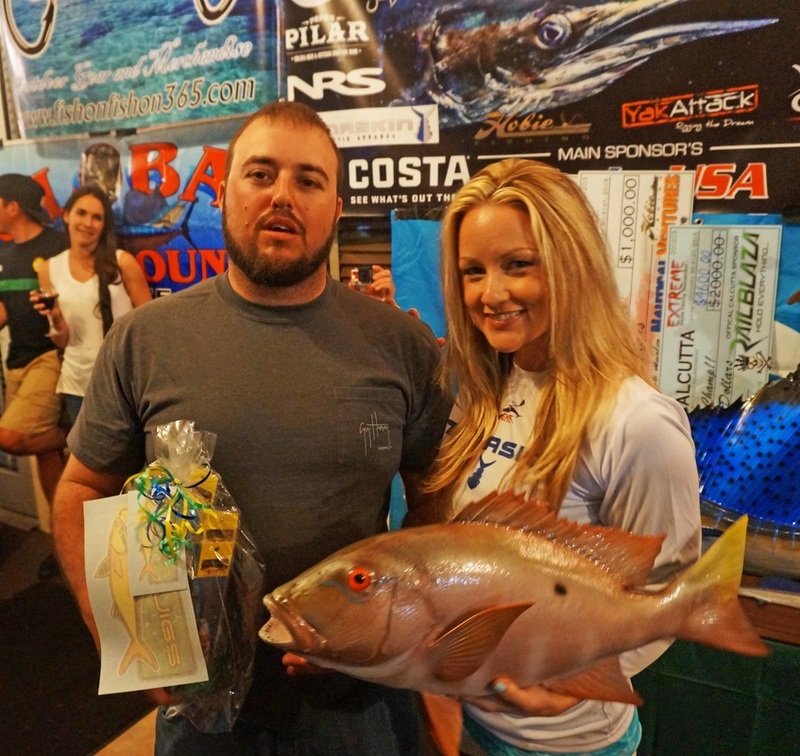 8th - $200 JimyJigs Gift Certificate Josh Coffman 6.5lbs. 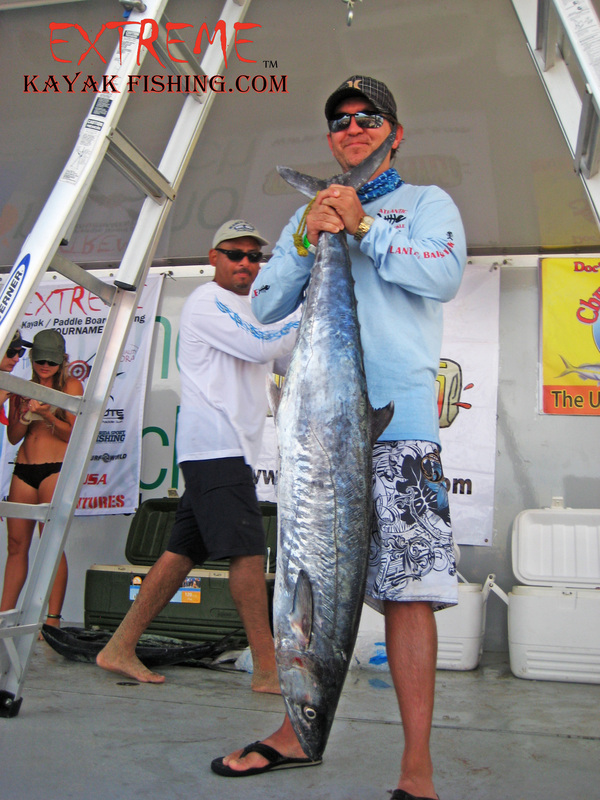 9th - $100 AFTCO Gift Certificate Paul Mctigue 6.4lbs. 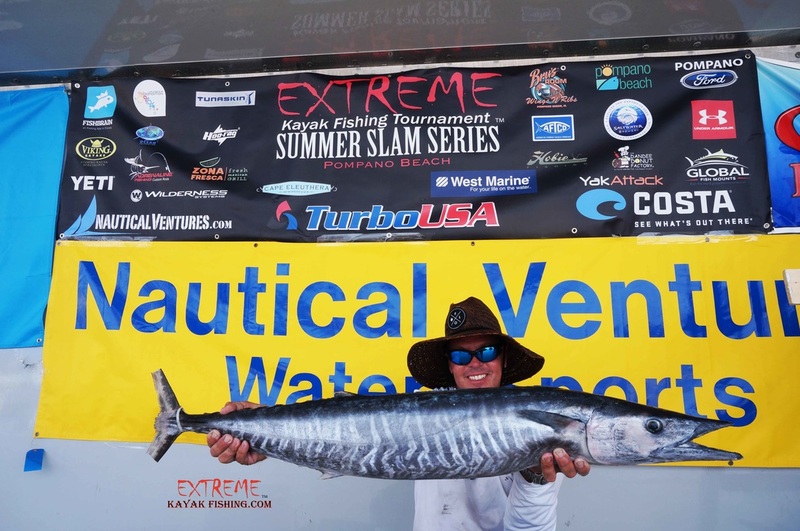 $500.00 YakAttack Wahoo Division: Heaviest single Wahoo Carl Slagle 52.3 lbs. 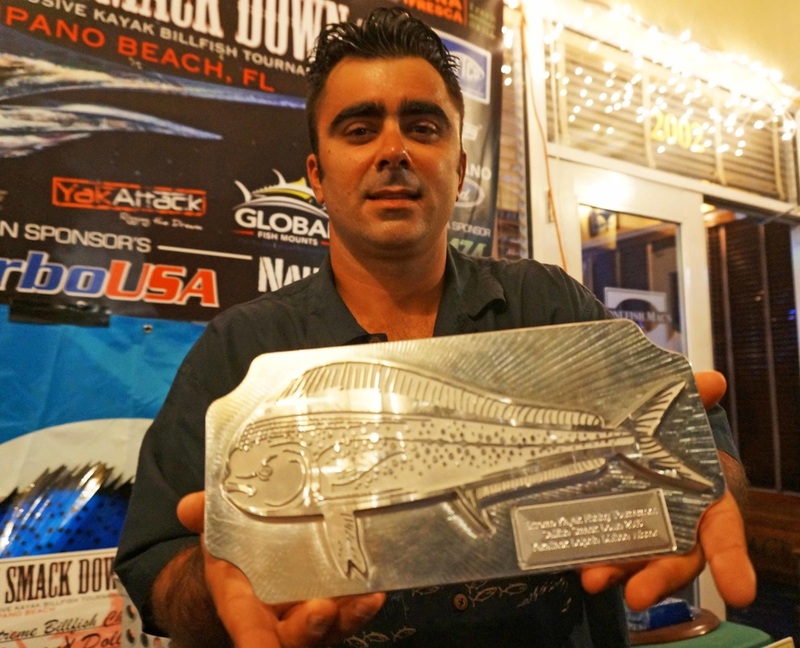 Single Heaviest Fish Division wins a custom wood art award carved by Keylo of Reel Nerve Carl Slagle 52.3lbs. 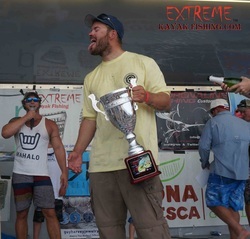 ​1st – Ricardo Palmero total weight 58.4 lbs. 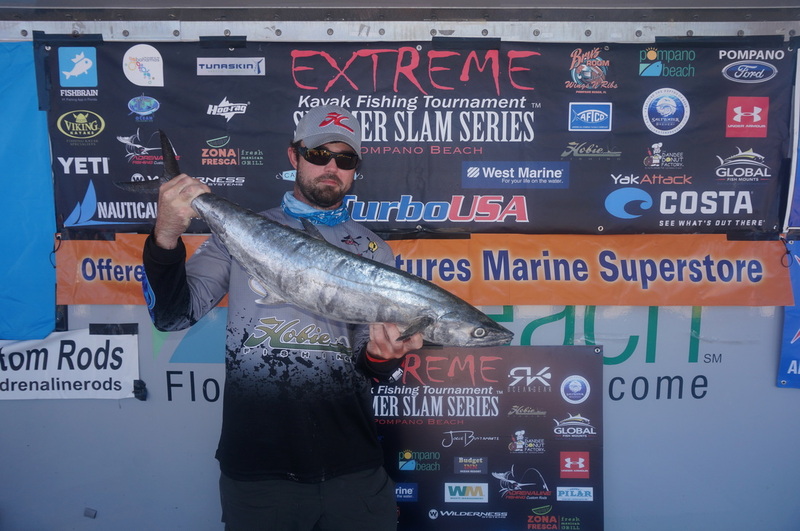 2nd – Benny Tousend total weight 39.4 lbs. 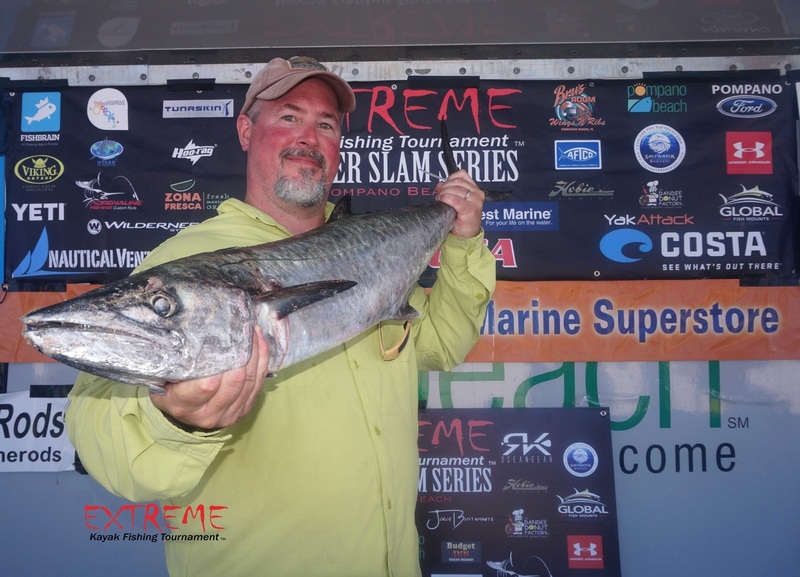 3rd – Fred York total weight 37.5 lbs. 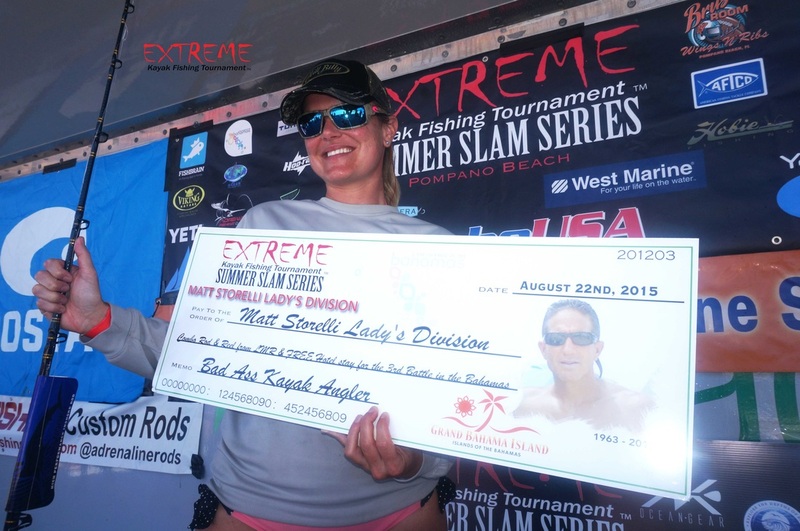 4th – Kristen Hansen 33.5 lbs. 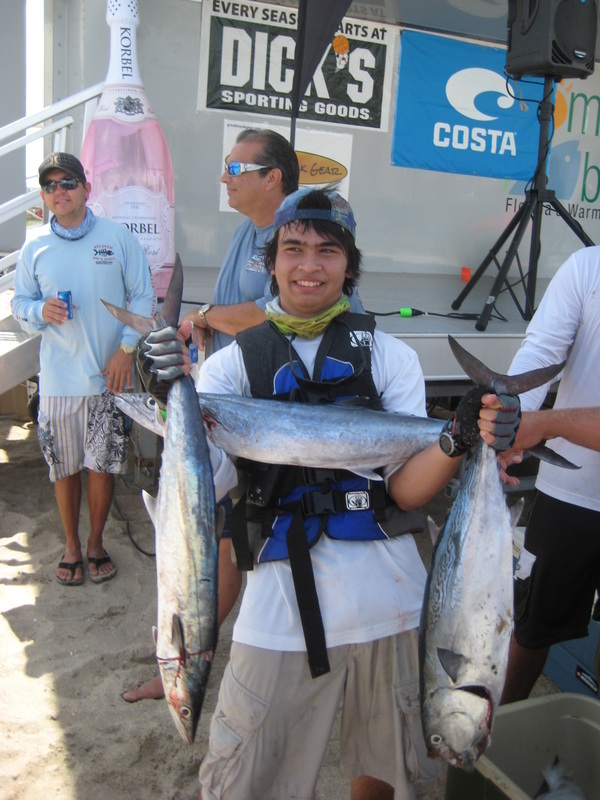 5th – Rob Rodriguez total weight 30 lbs. 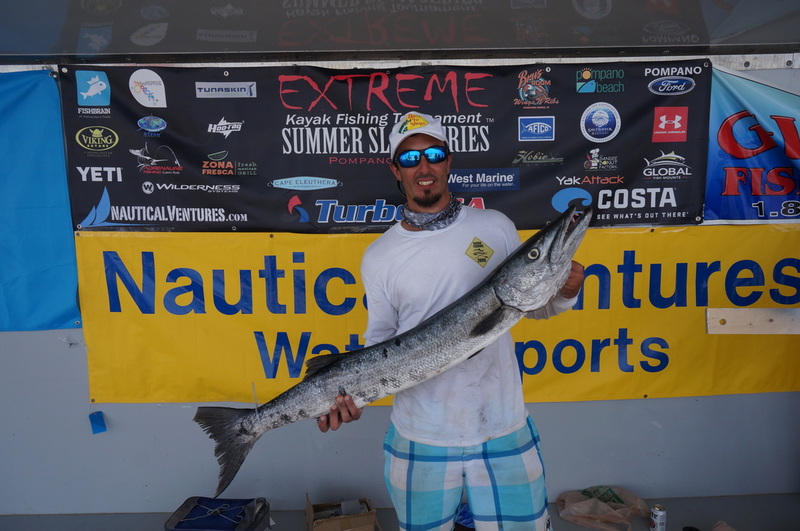 6th – Bobby Buzaki total weight 29.2 lbs. 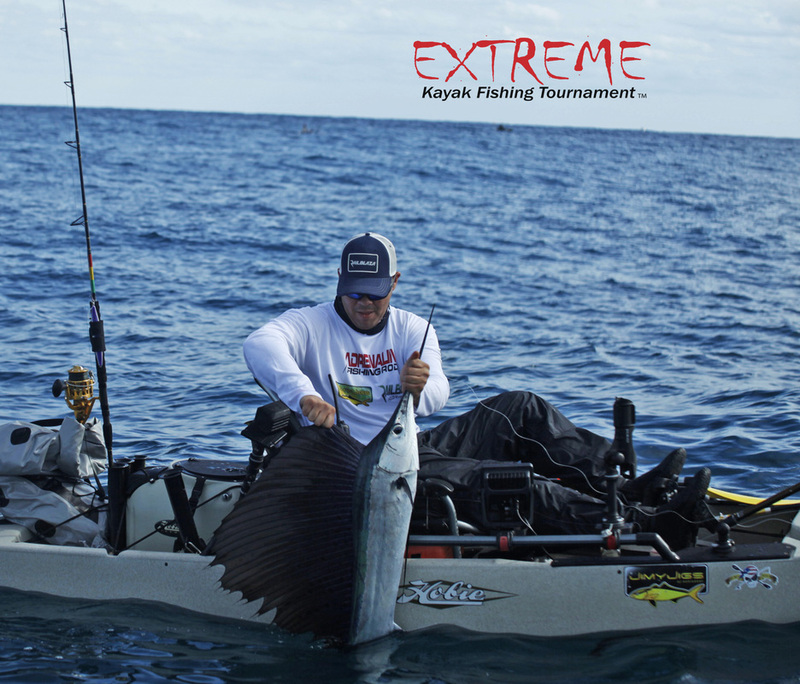 7th – Samuel Palacios total weight 28.6 lbs. 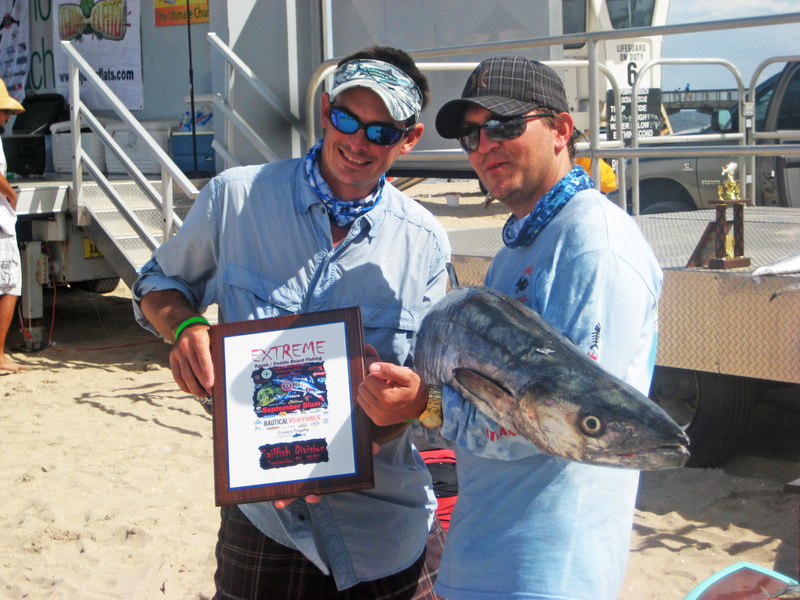 8th – James Butters total weight 23.5 lbs. 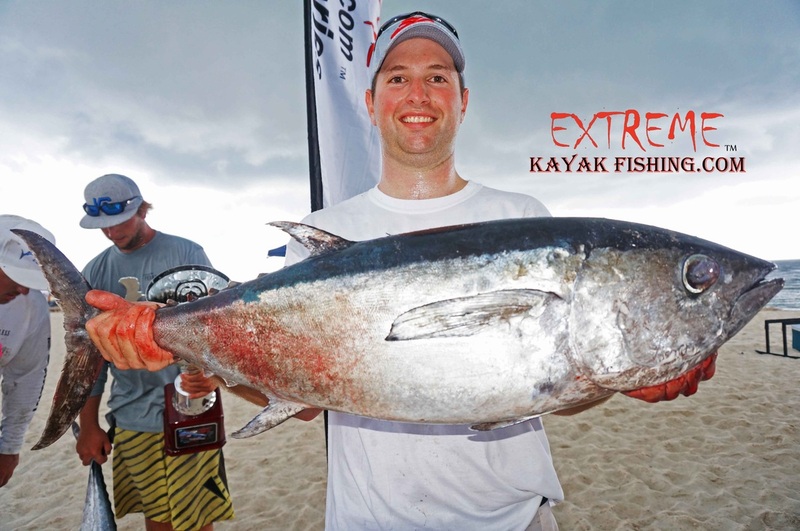 9th – Daniel Gauzens total weight 22.9 lbs. 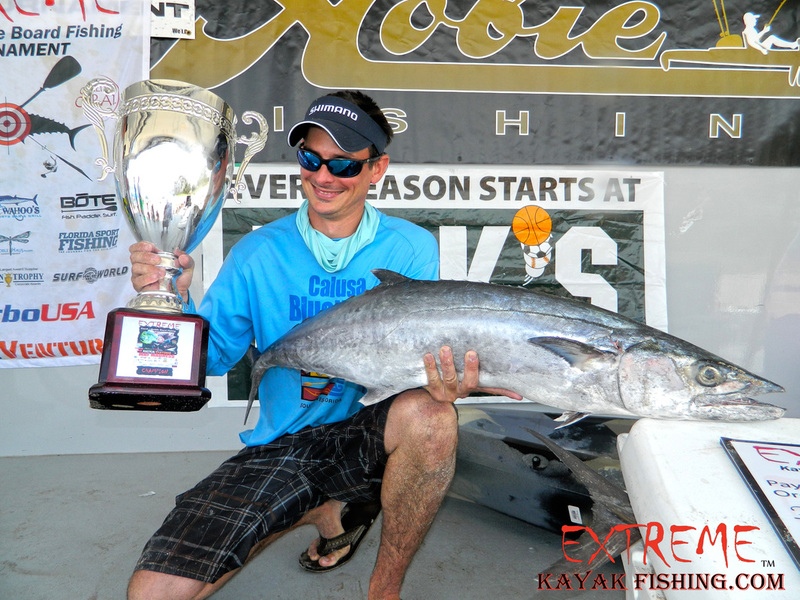 10th – Daniel Foster total weight 20.2 lbs. 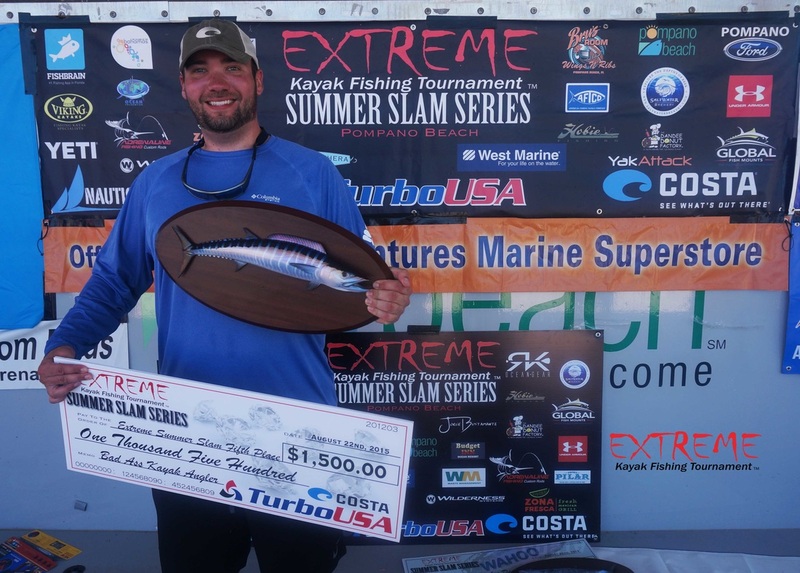 1ST goes to Joe Kraatz earning him the $10,000.00 donated by main sponsors FishBrain and Turbo USA and a Keylo of Keylo Art Trophy. 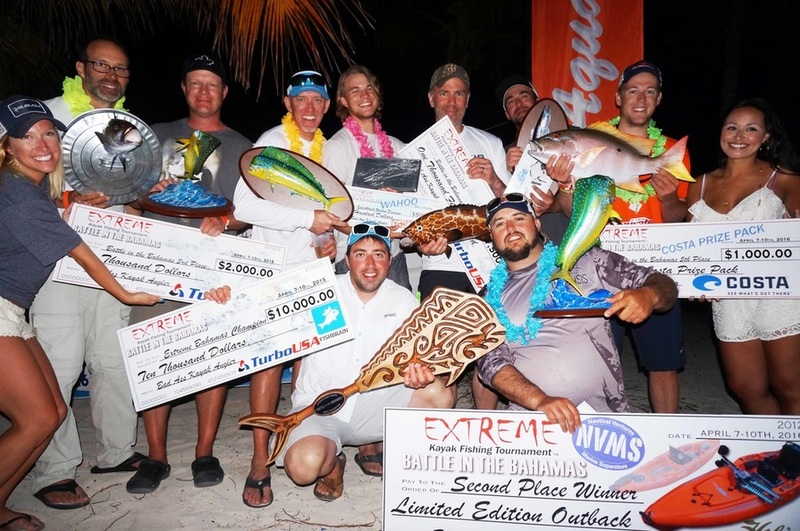 Kraatz had an astonishing 72.9 lbs of fish weighed in over the two day tournament. 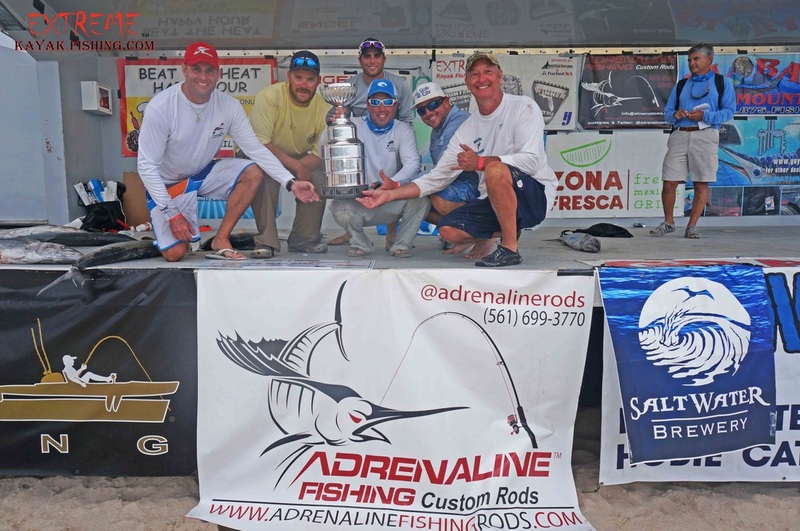 2nd - Brandon Nodal with his total weight of 54.8lbs winning a Hobie Limited Edition Outback (ONLY 500 MADE) from main sponsor Nautical Ventures and a Plaque from Global along with COSTA Glasses. 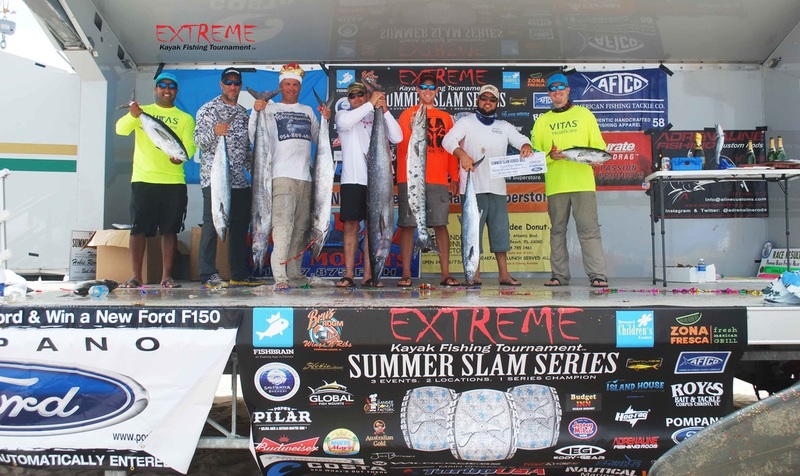 CARL TORRESSON TAKES FIRST PLACE IN THE EXTREME SUMMER SLAM PART 1 WITH HIS WEIGHT AT 45.2LBS! 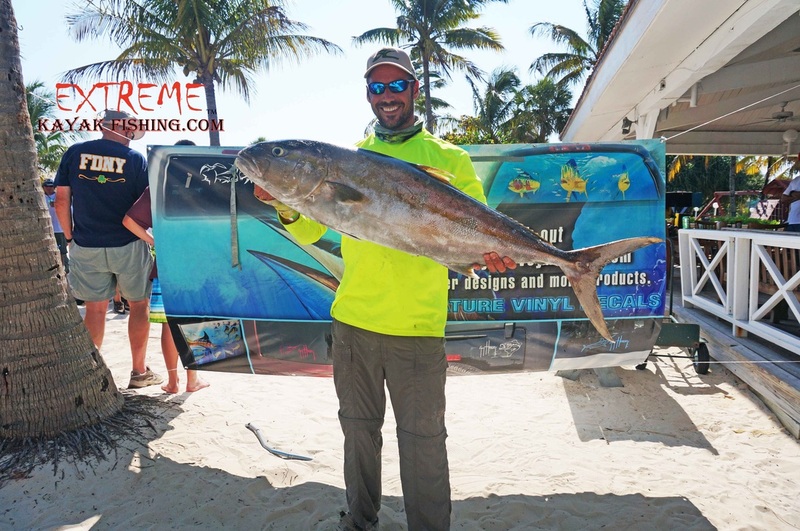 HE WINS $4,000 FROM TURBO USA!! MIKE WOOD WINS SECOND PLACE WITH 30.1LBS. HE WINS A 2015 HOBIE OUTBACK FROM NAUTICAL VENTURES. 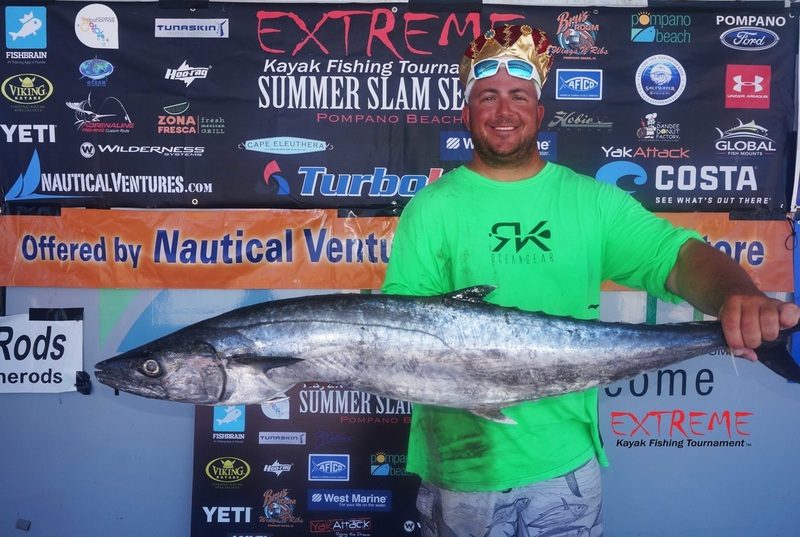 JON VENARCHICK JUMPS ON THIRD PLACE WITH A 25.3LB KING. 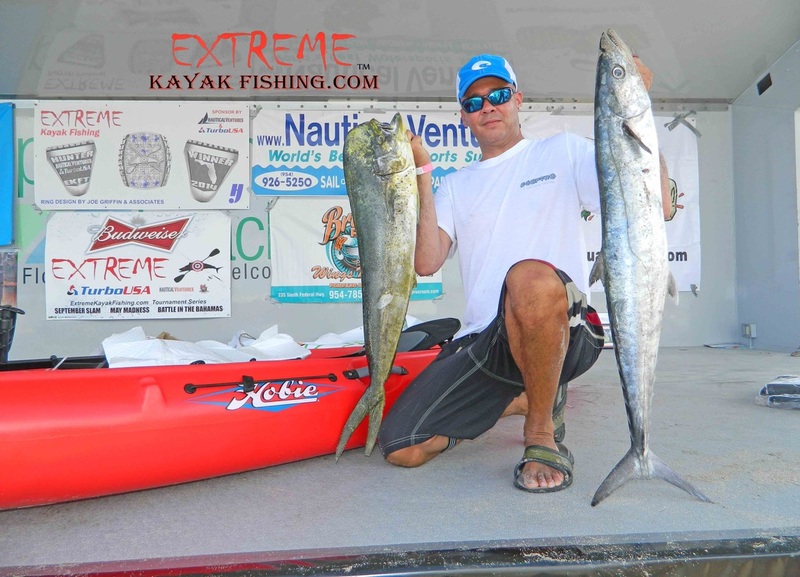 HE WINS A HOBIE REVO FROM NAUTICAL VENTURES & A PLAQUE FROM GLOBAL FISH MOUNTS. 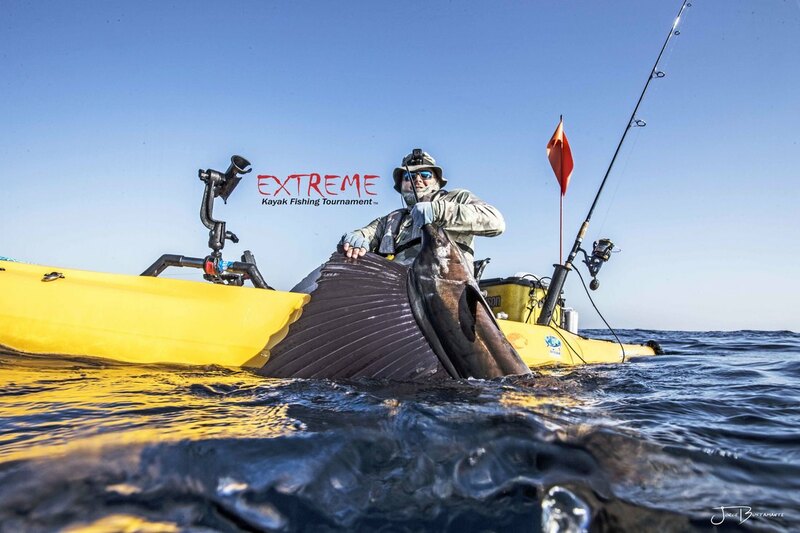 DAVID GAUZENS WINS FOURTH PLACE WITH HIS 17.9LB KING TAKING HOME A VIKING RELOAD KAYAK & A GLOBAL FISH MOUNTS TROTHY. 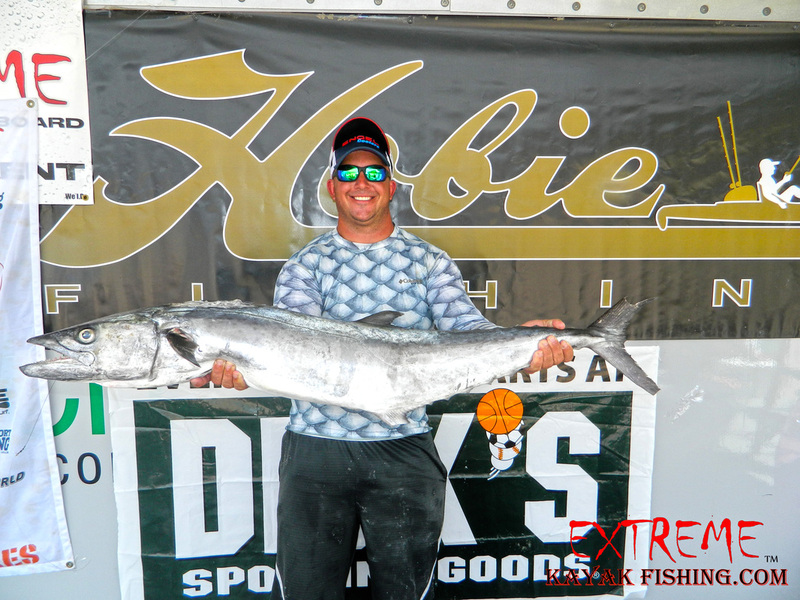 DANIEL FOSTER WINS FIFTH PLACE WITH A 16.7LBS WINNING $1,500 FROM TURBO USA & A GLOBAL FISH MOUNTS TROPHY. 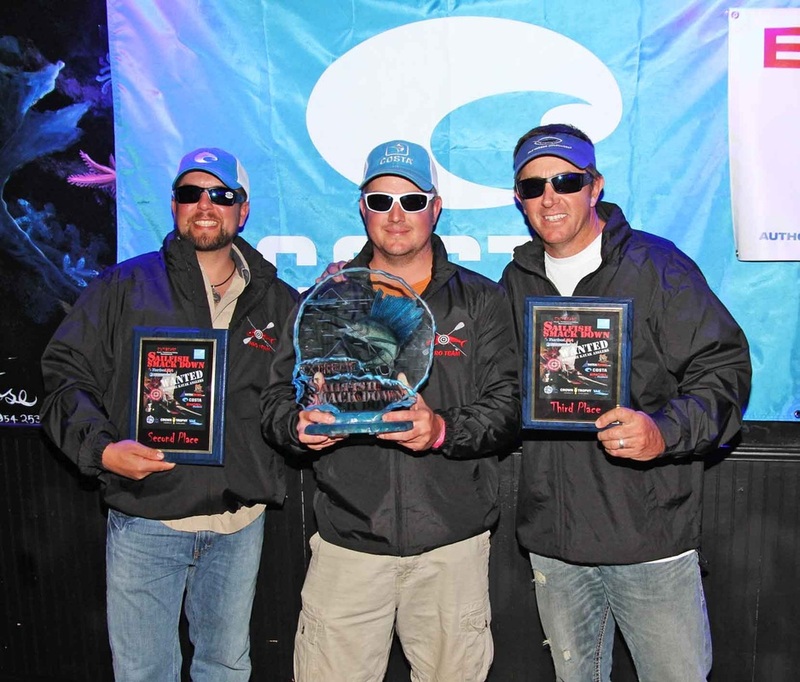 MICHAEL WELSH WINS 6TH PLACE WINNING COSTA GLASSES AND A PLAQUE FROM GLOBAL FISH MOUNTS. JASON BROACH WINS 7TH WITH HIS 11.4LB KING TAKING HOME A MAXEL REEL FROM BIMINI BAY. 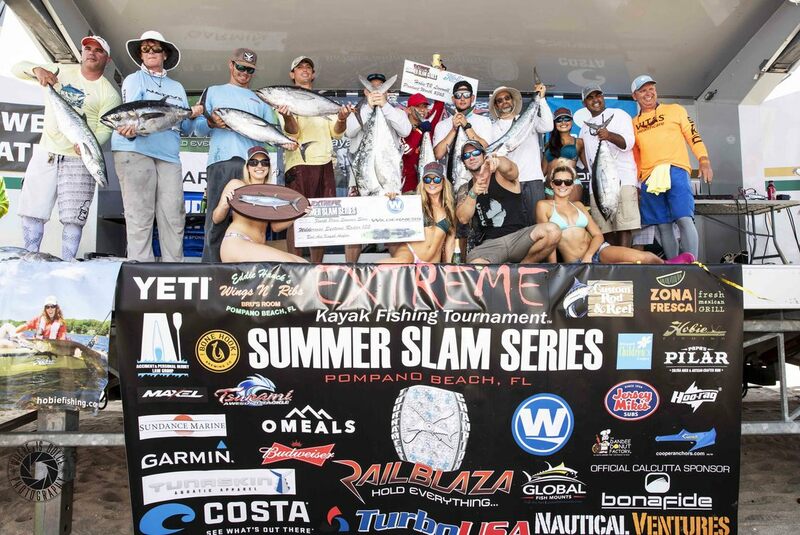 COLAN BUKOWSKI WINS THE POPULAR TRASH CAN SLAM DIVISION. 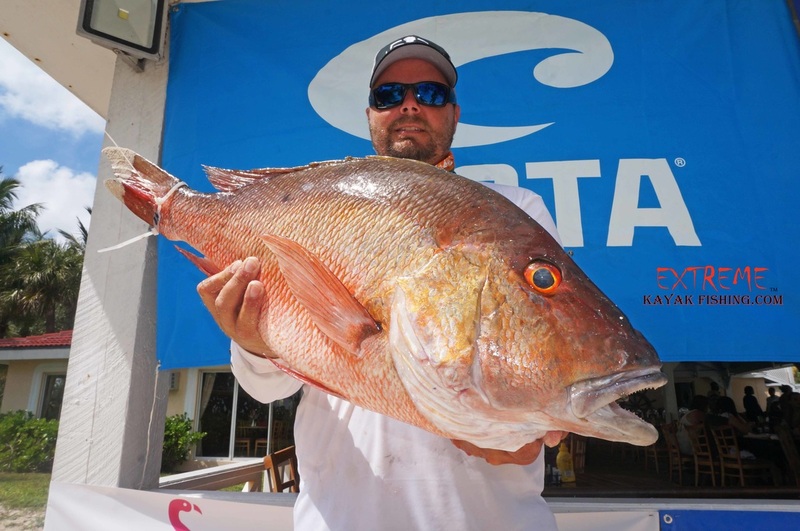 HE TAKES HOME A GLOBAL FISH MOUNTS TROPHY AND COSTA GLASSES. 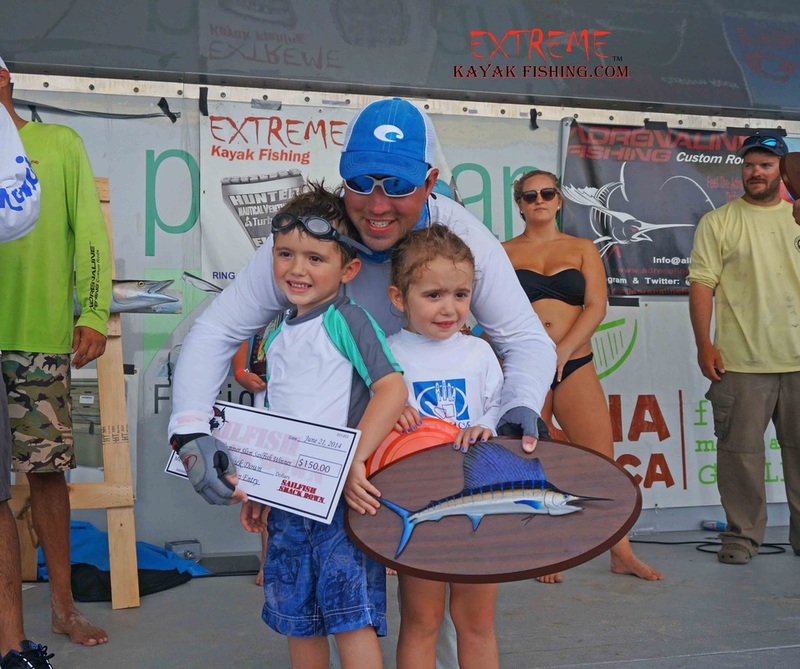 BRANDON NODAL WINS THE WEST MARINE SAILFISH DIVISION. 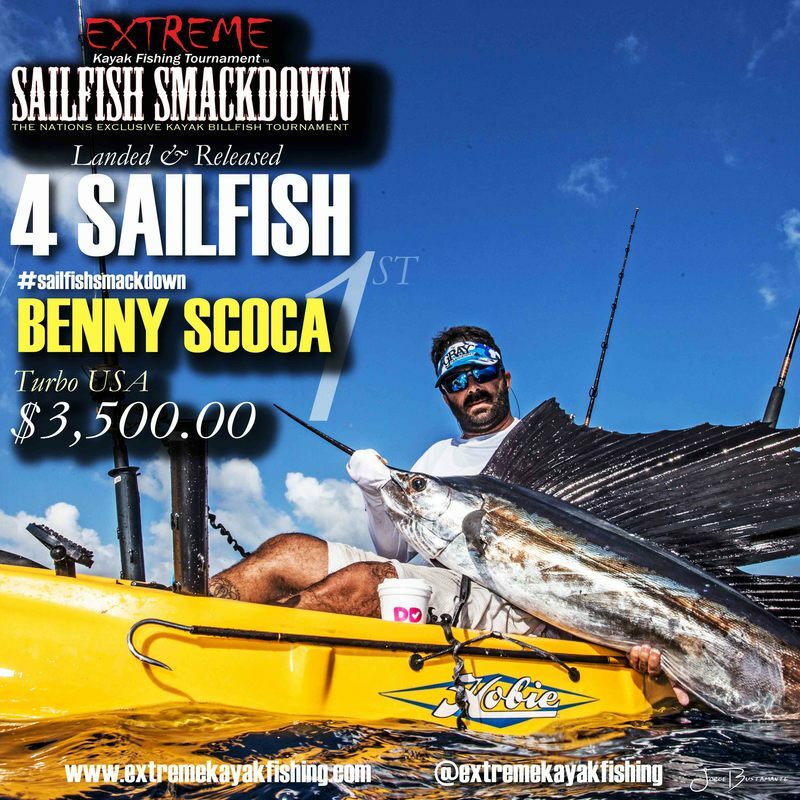 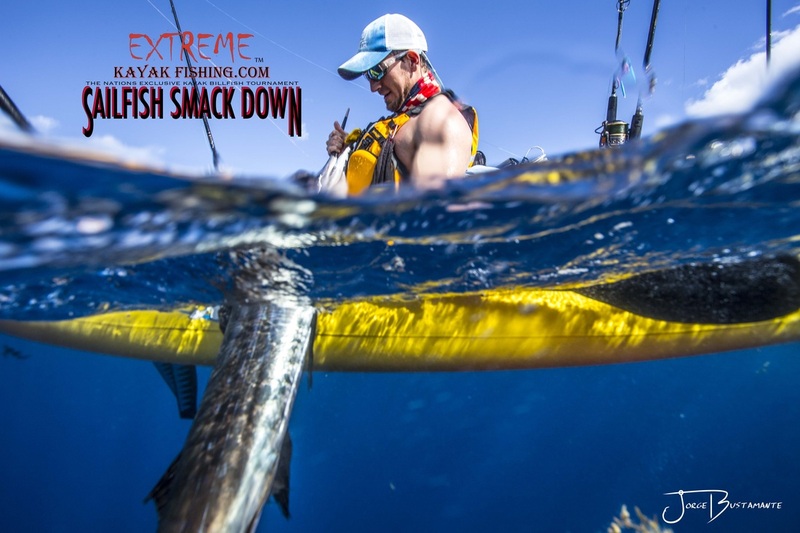 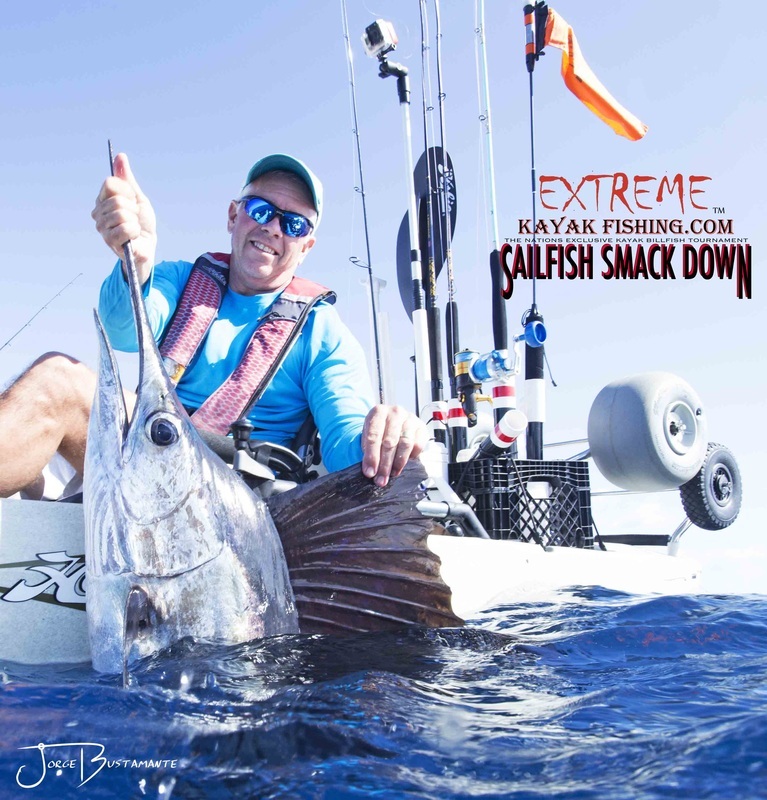 HE WINS A FREE ENTRY TO THE 2016 SAILFISH SMACK DOWN. 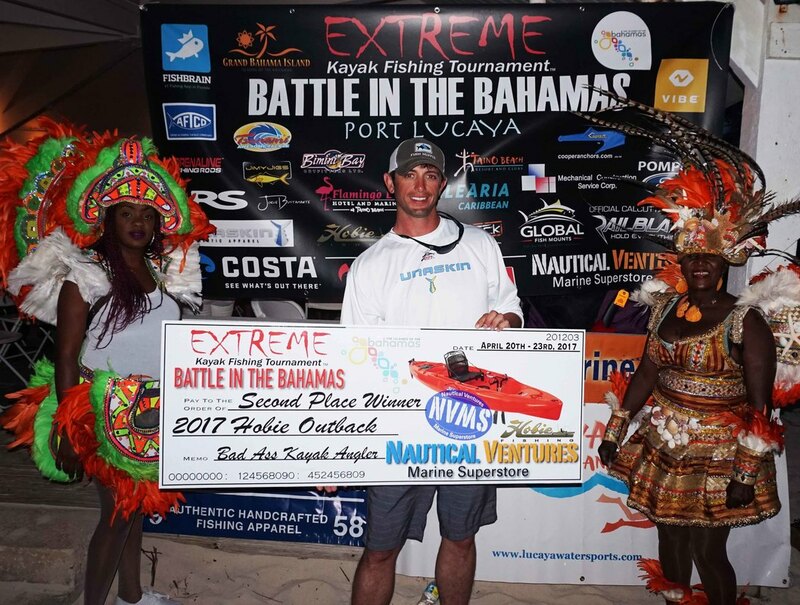 NICOLE OLKEN WINS THE MATT STORELLI LADY DIVISION WINNING A LMR COMBO ROD & REEL & A PAID TRIP TO THE 2016 BATTLE IN THE BAHAMAS. 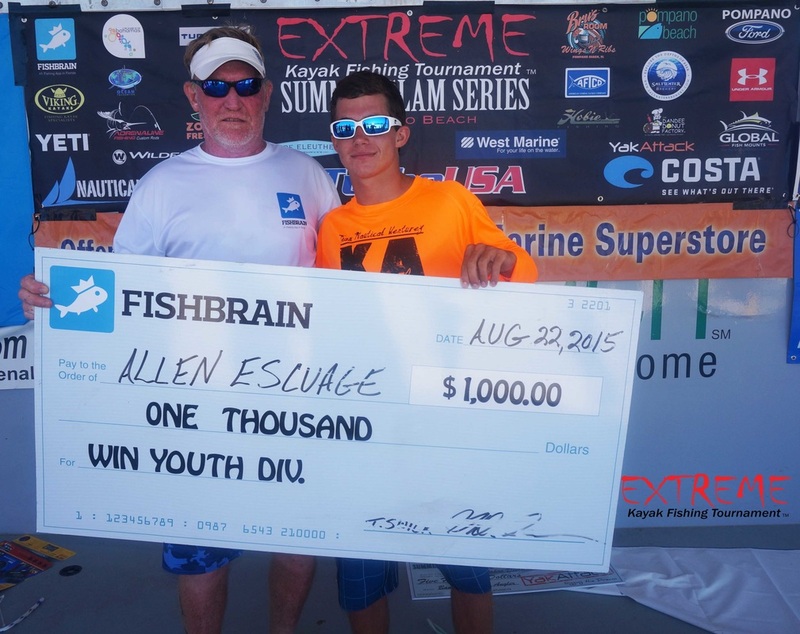 ALLEN ESCUAGE WINS THE FISHBRAIN JUNIOR DIVISION WITH A 9.3LB KING WINNING $1,000.00 FROM FISHBRAIN. 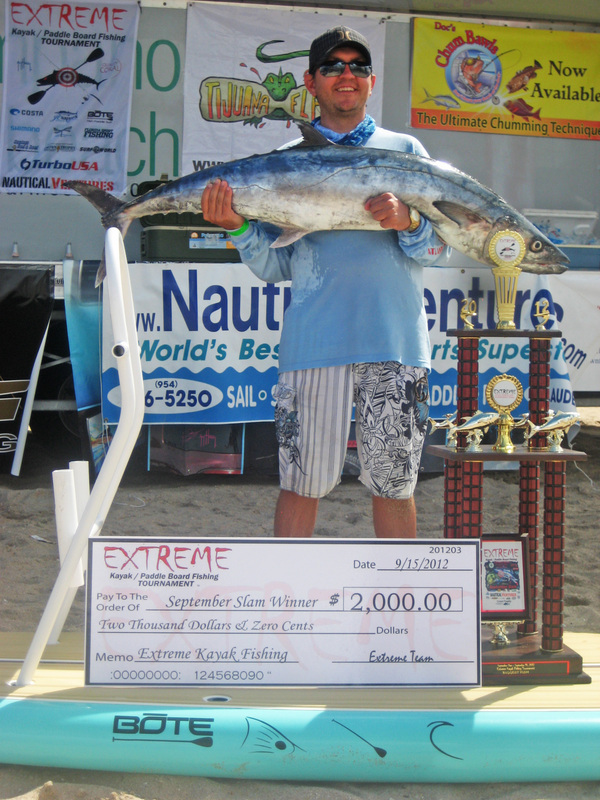 FIRST TIME CHAMPION CARL TORRESSON TAKES FIRST PLACE IN THE EXTREME SUMMER SLAM PART 1 WITH HIS WEIGHT AT 40.5LBS! 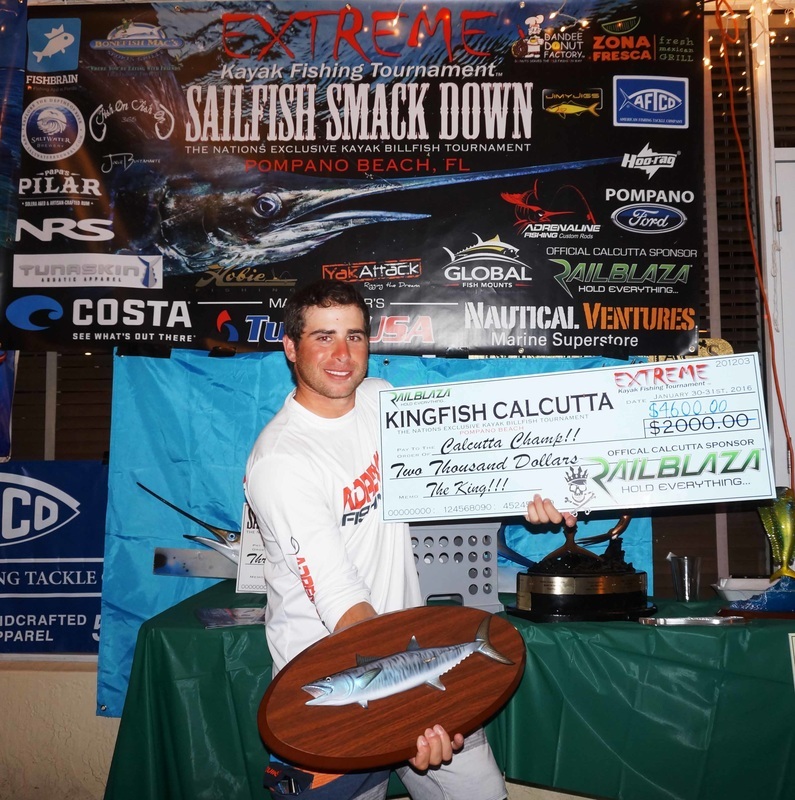 HE WINS $4,000 FROM TURBO USA, TROPHY & THE KINGFISH CALCUTTA WORTH $3,300!!! 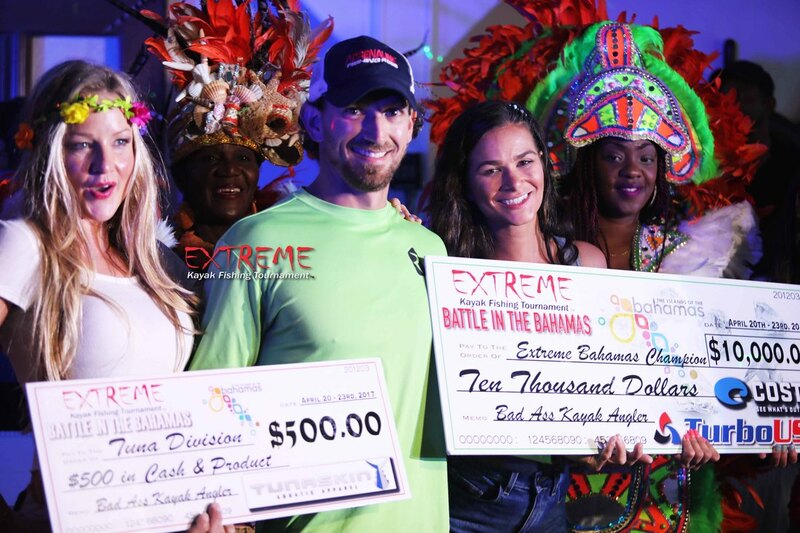 TOTAL PAYOUT $7,300.00. 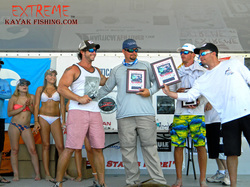 ADAM ROECK WINS SECOND PLACE WITH 18.9LBS. 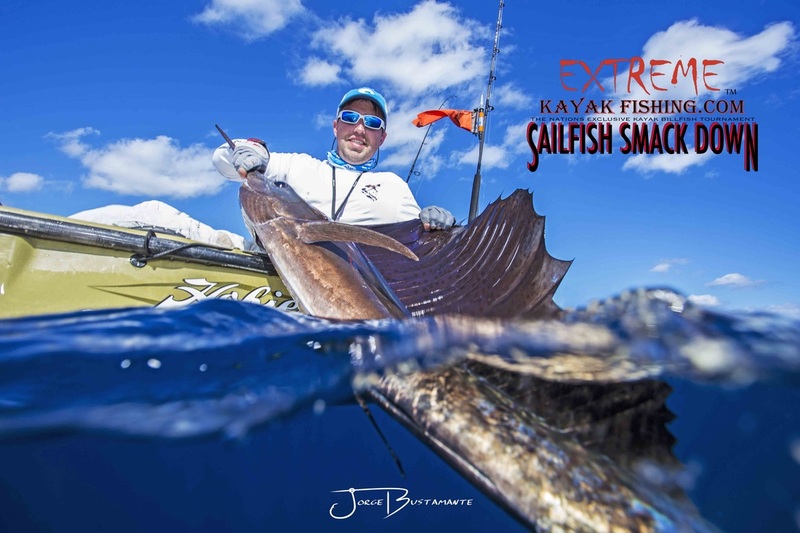 HE WINS A 2015 HOBIE OUTBACK FROM NAUTICAL VENTURES & COSTA GLASSES. 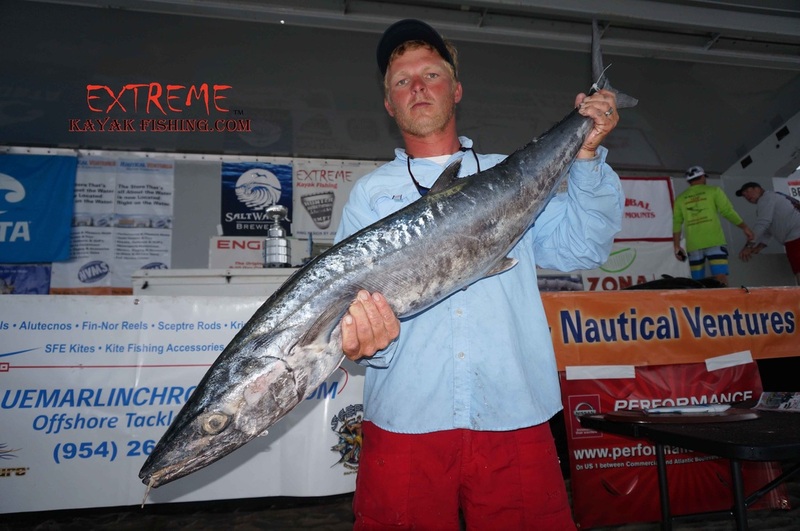 LANCE IRVINE JUMPS ON THIRD PLACE WITH A 17.2 WAHOO. 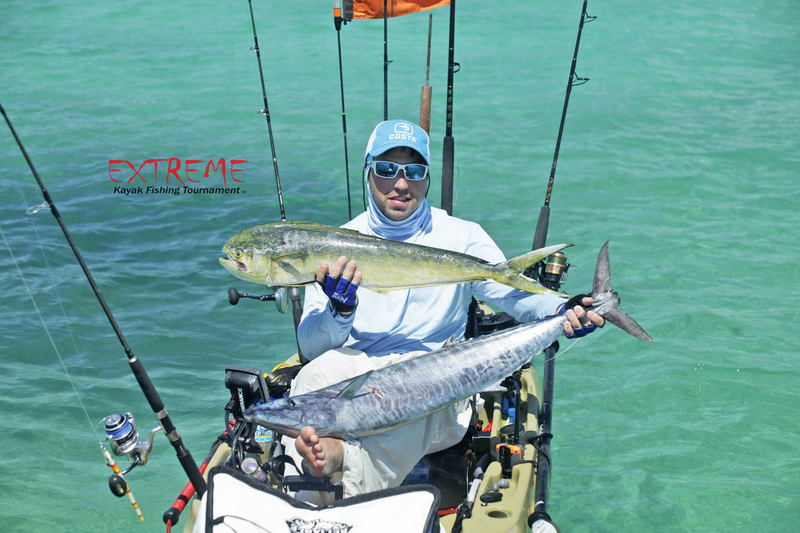 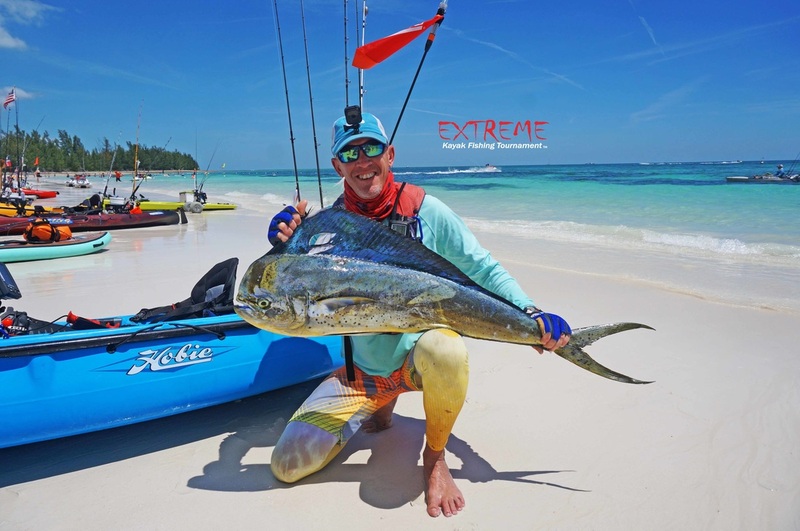 HE WINS A HOBIE REVO FROM NAUTICAL VENTURES & A TROPHY FROM GLOBAL FISH MOUNTS. 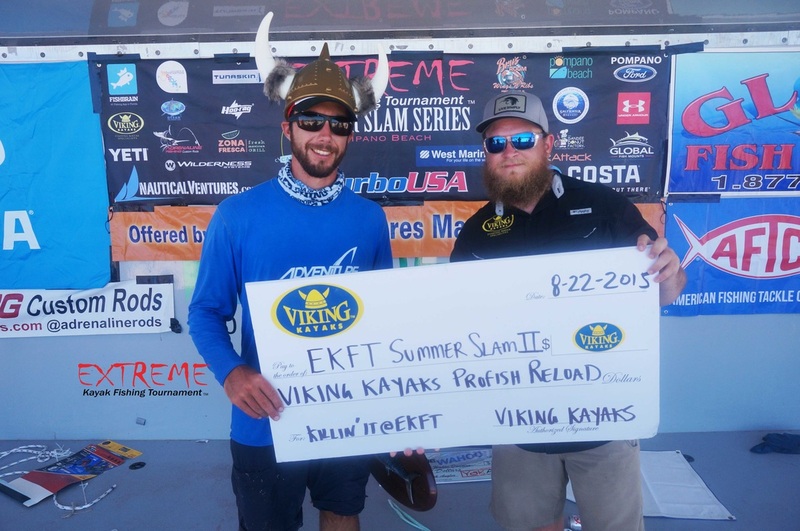 JOHN MCKROID WINS FOURTH PLACE WITH HIS 14.9LB KING TAKING HOME A VIKING RELOAD KAYAK & A GLOBAL FISH MOUNTS TROTHY. 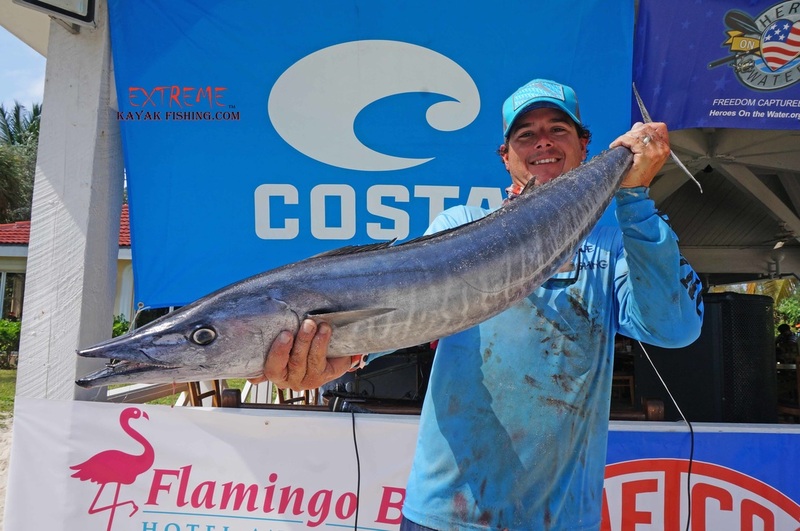 ADAM FISK WINS FIFTH PLACE WITH A 14.8LBS WINNING $1,500 FROM TURBO USA, COSTA GLASSES & A GLOBAL FISH MOUNTS TROPHY. 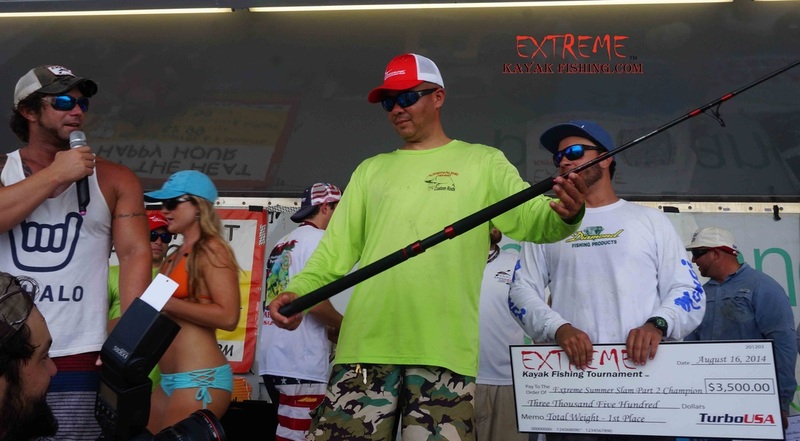 BILL SIKORA WINS 6TH PLACE WINNING A COMBO ROD AND REEL AND A TROPHY FROM GLOBAL FISH MOUNTS. 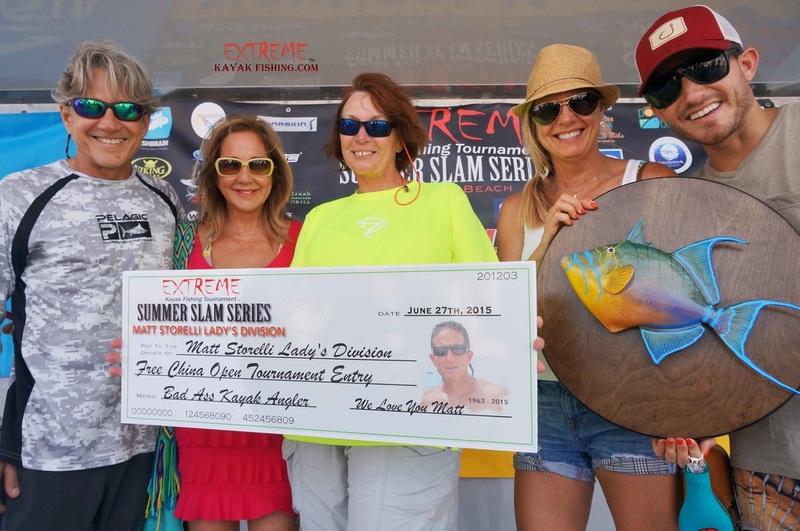 PAMELA WIRTH WINS THE MATT STORELLI LADY DIVISION WINNING A PAID TRIP TO CHINA TO COMPETE IN THE OPEN. 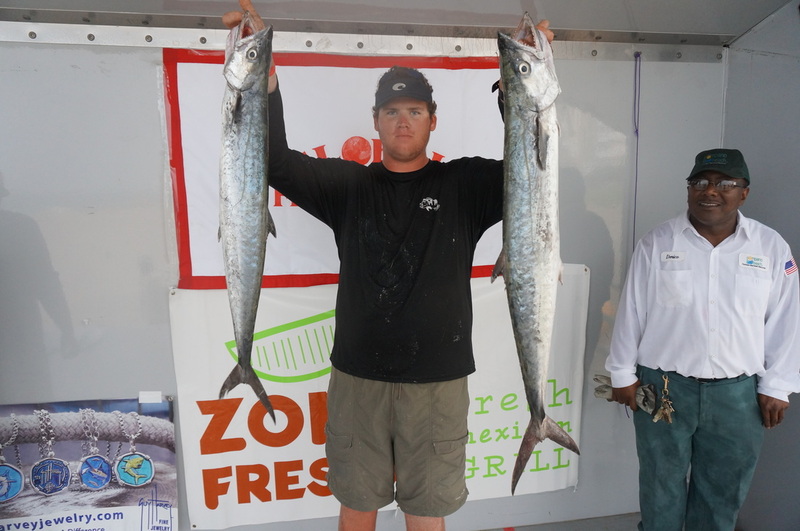 CASEY DEBRECHT WINS THE FISHBRAIN JUNIOR DIVISION WITH A 23.3LB KING WINNING $1,000.00 FROM FISHBRAIN. 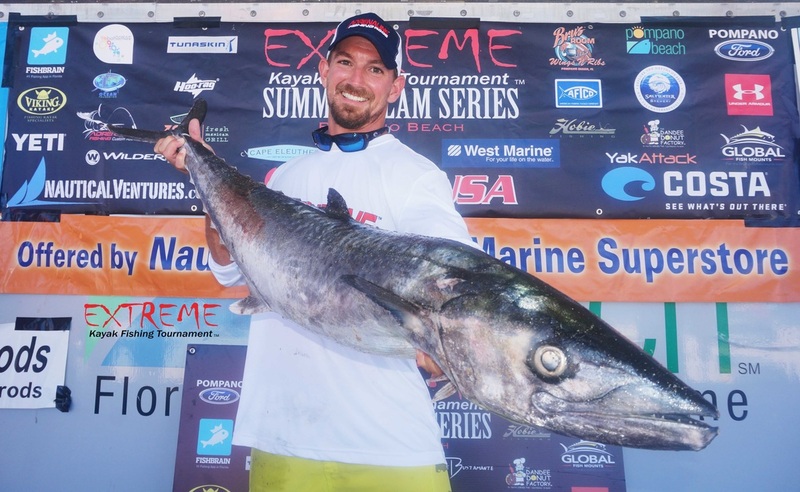 CHRISTOPHER SIMMONS WINS THE WEST MARINE SAILFISH DIVISION CATCHING AND RELEASING HIS SAIL AT 8:11AM. 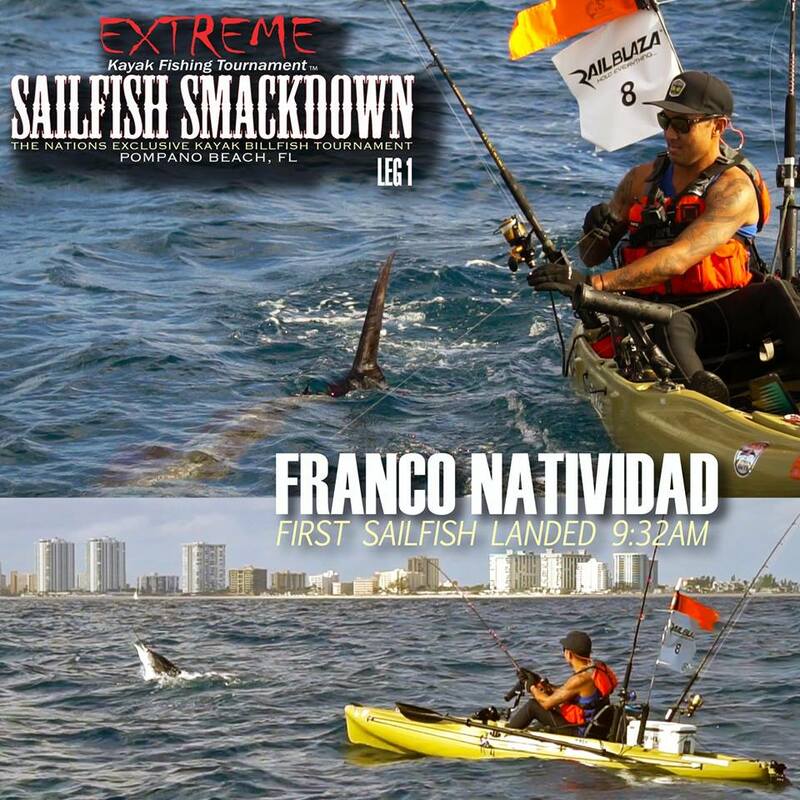 HE WINS A FREE ENTRY TO THE SAILFISH SMACK DOWN. 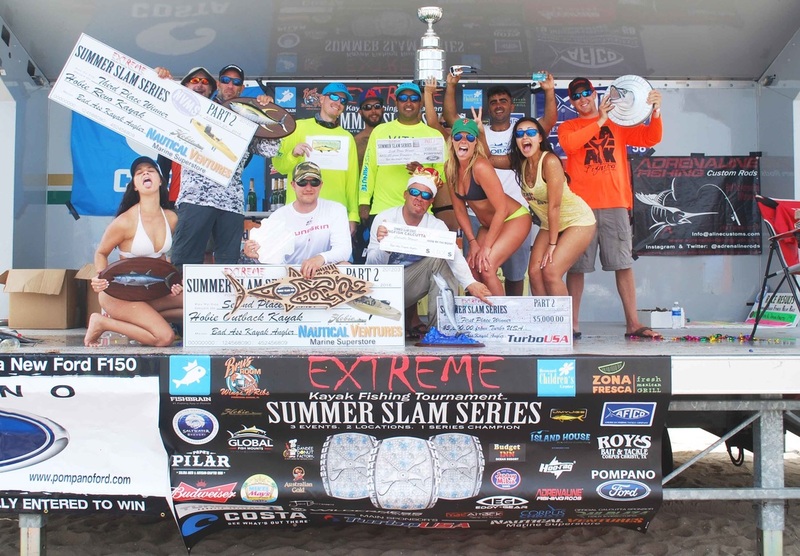 LEANDRO PERA WINS THE POPULAR TRASH CAN SLAM DIVISION. 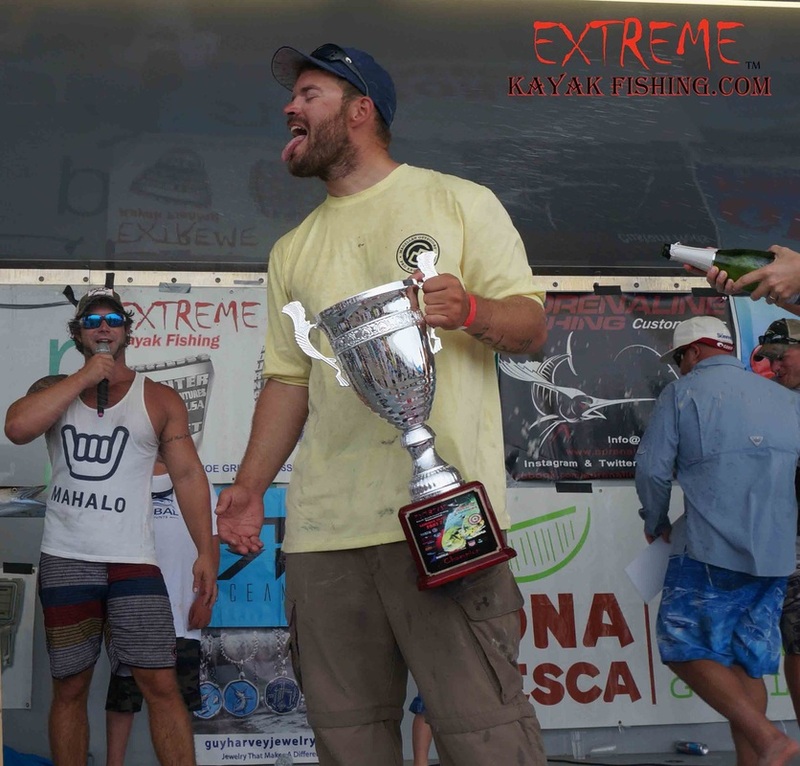 HE TAKES HOME A GLOBAL FISH MOUNTS TROPHY AND COSTA GLASSES. 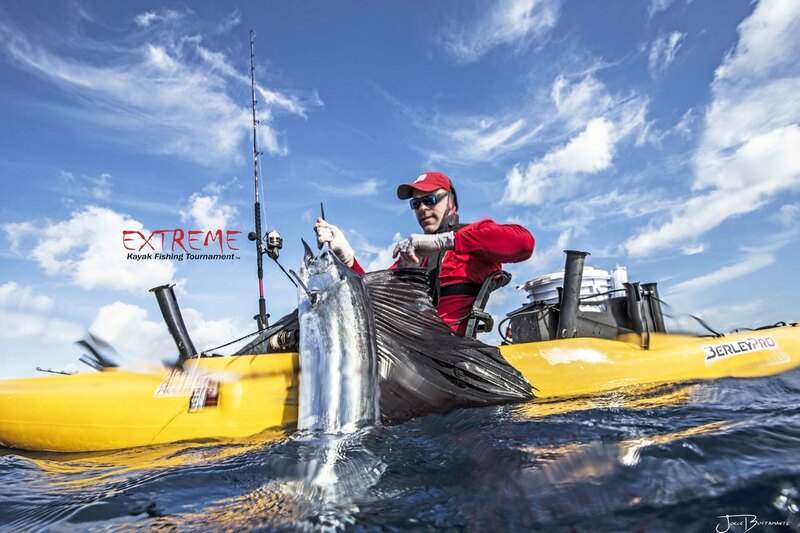 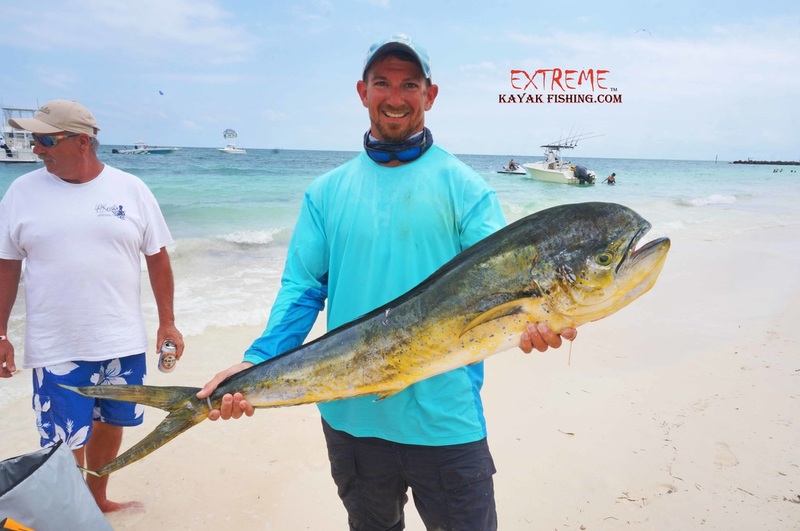 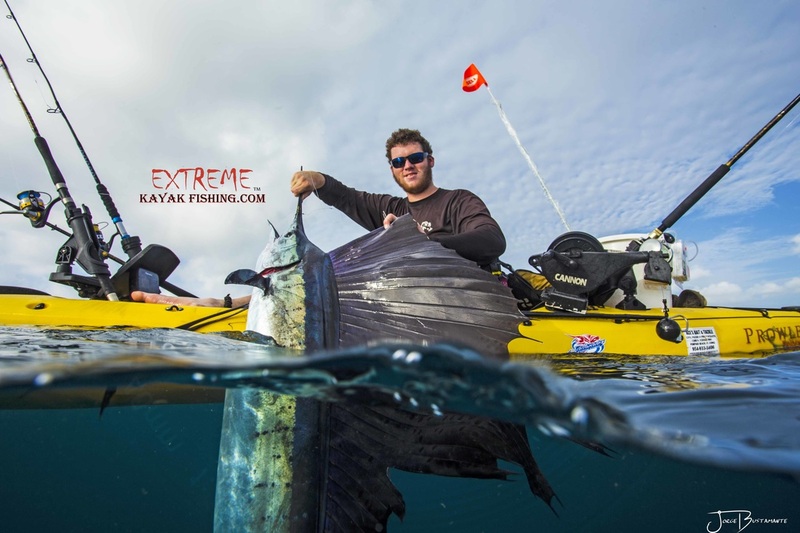 Adam Fisk wins fourth place catching the biggest dolphin in Extreme history. 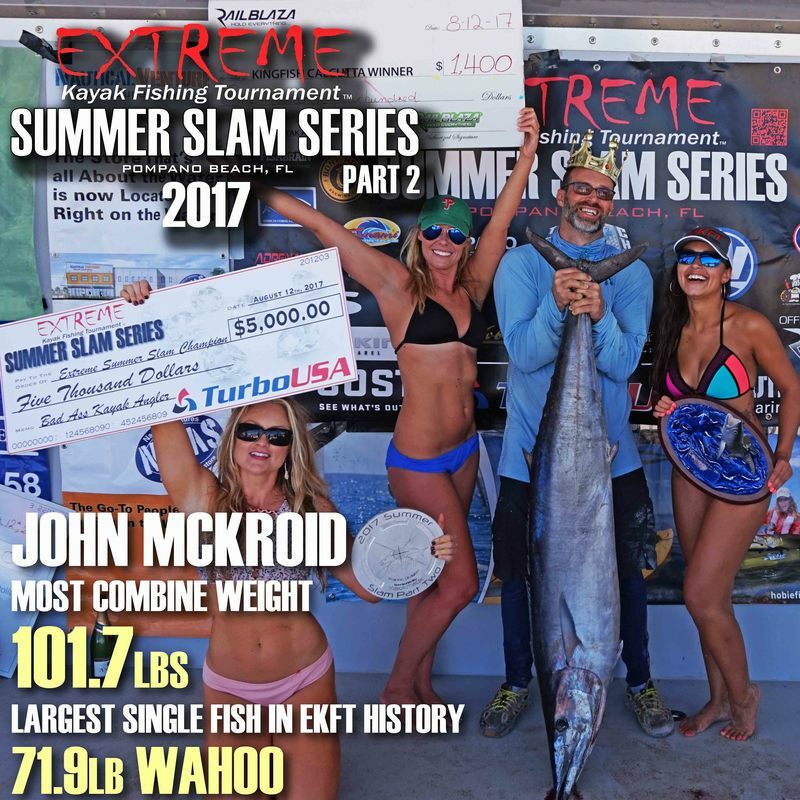 Total weight at 29.3lbs! 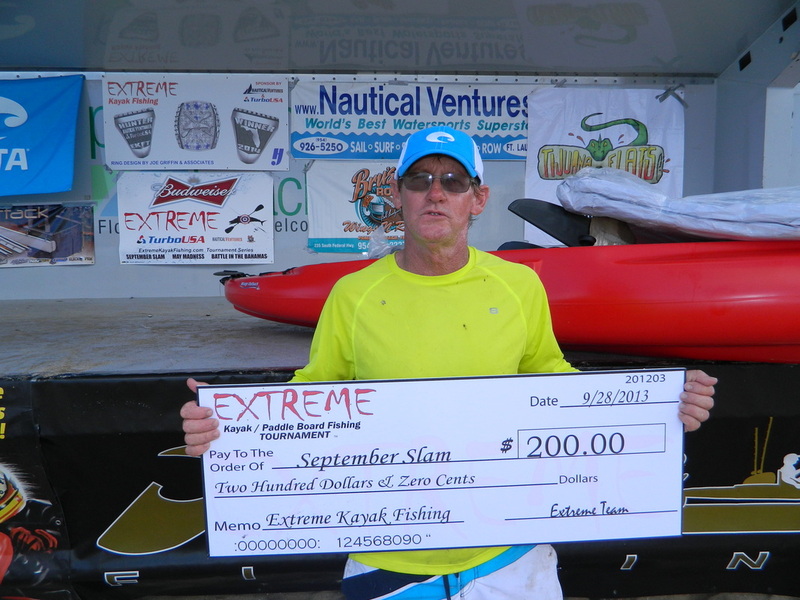 He won $500.00 from Turbo USA & Costa Glasses. 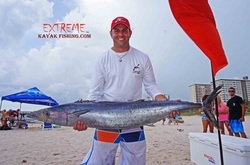 Nick Dimov wins the Grouper Division taking home $500 from YakAttack! 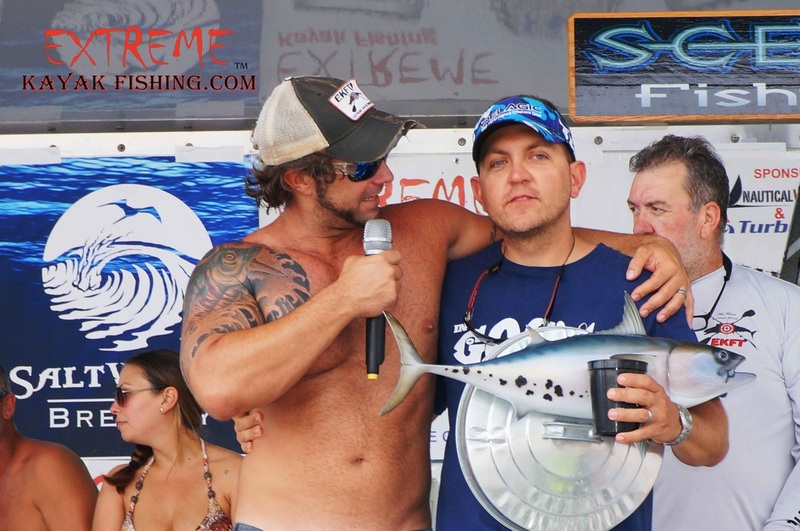 Jon Venarchick wins the Dolphin Calcutta worth $350! 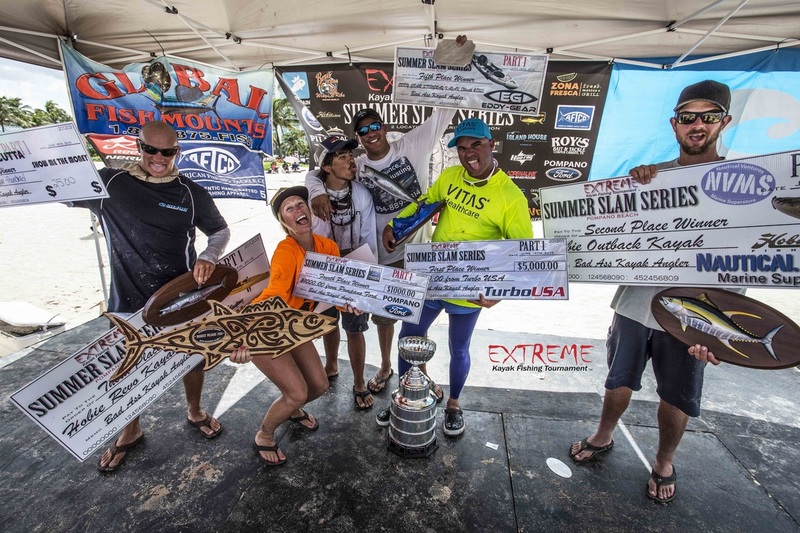 Austen Collins wins the popular Trash Can Slam Division taking home Costa Glasses & The Trash Can Trophy made by Global Fish Mounts. 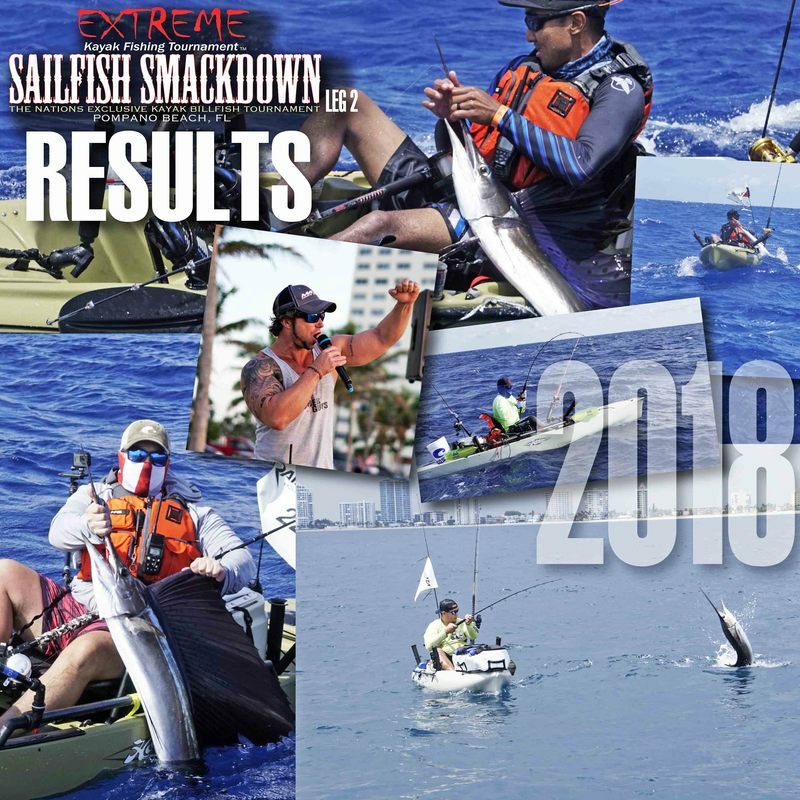 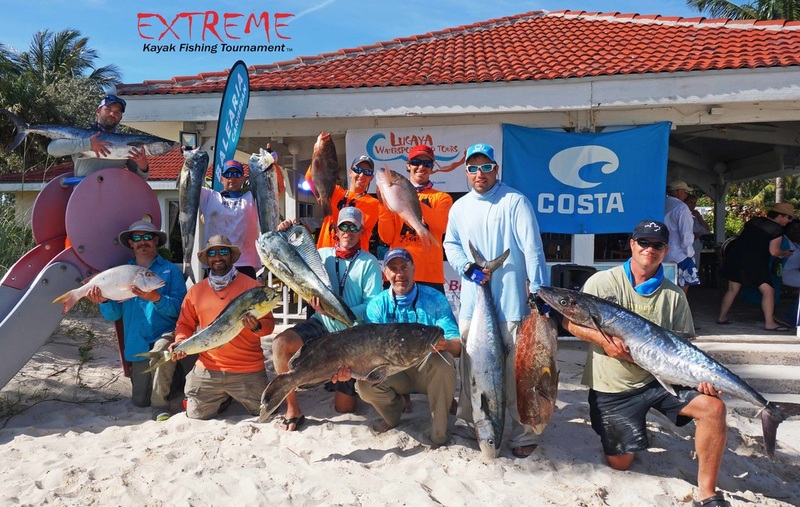 Jon Venarchick from Naples wins the 2015 Sailfish Smack Down winning $3,000 from Turbo Usa, Costa Glasses & a sailfish mount from Global Fish Mounts. 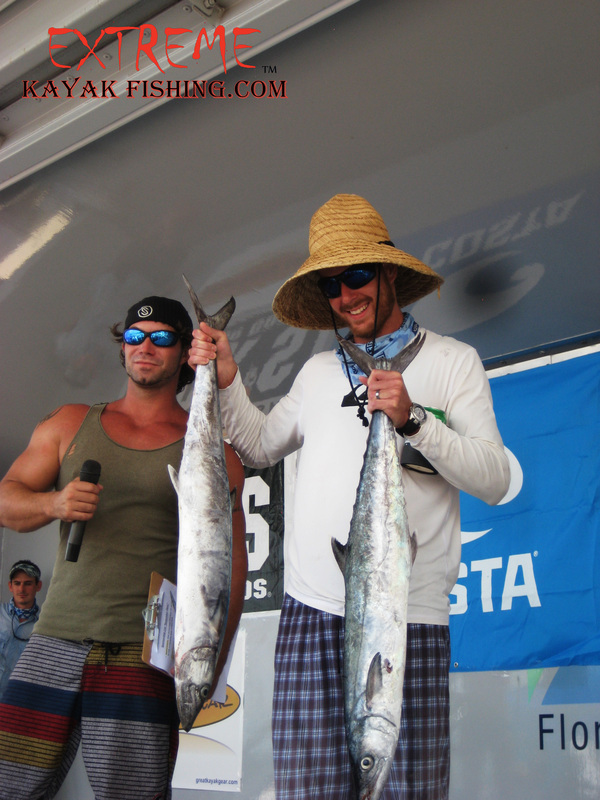 Brian Whelan wins 4th place nabbing a nice pair of Costa Glasses! 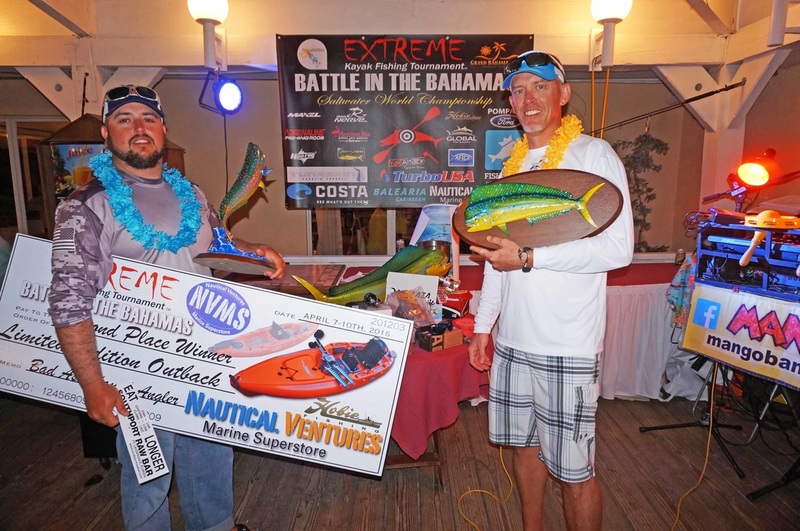 Local angler Rob Rodriguez takes 2nd place winning $1,000 from Nautical Ventures, Costa Glasses & plaque from Global Fish Mounts. 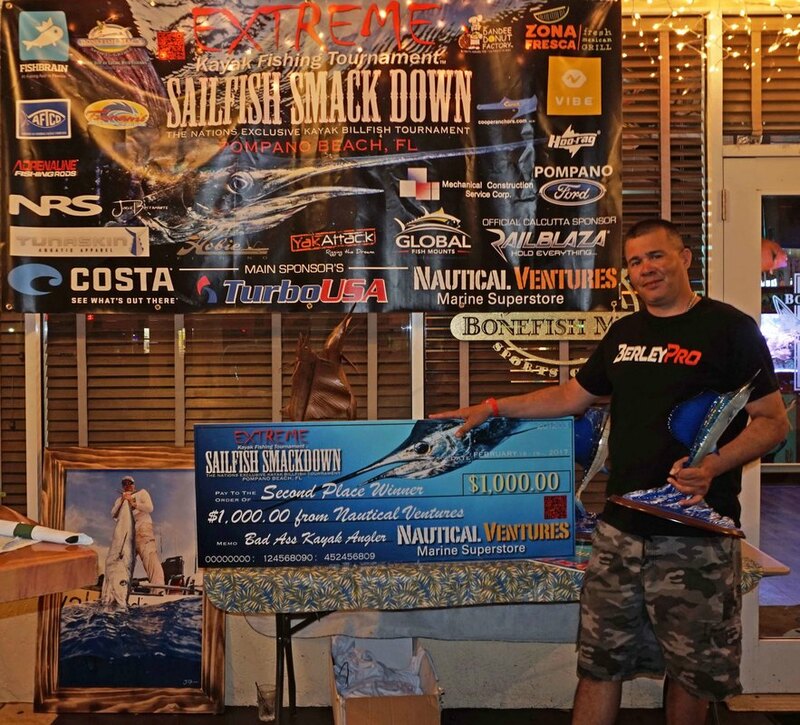 Lynn Hall from Oklahoma grabs 5th place winning a custom sailfish painting from Pete Agardy. 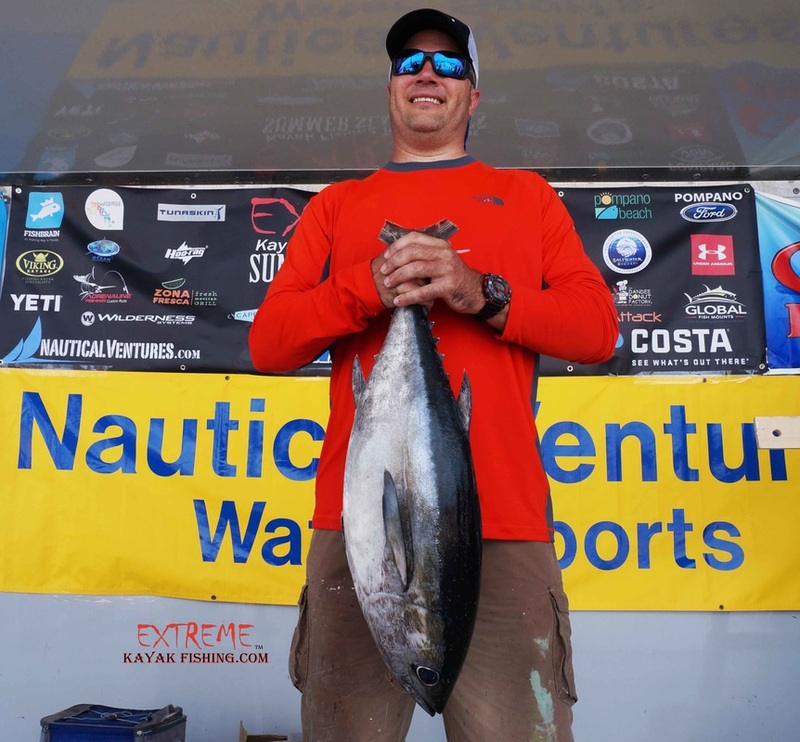 The consistent Joe Kraatz wins 3rd place taking home $500 from Nautical Ventures, Costa Glasses & plaque from Global Fish Mounts. 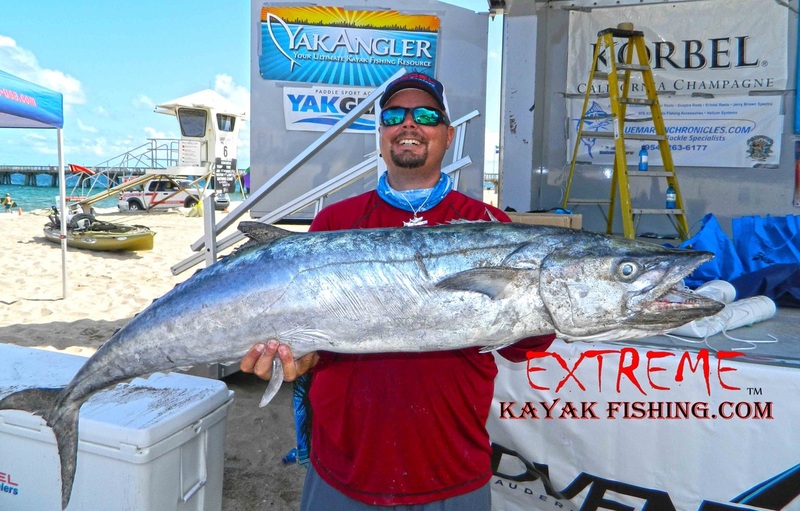 Tod Johnson from Texas wins the YakAttack Dolphin Division winning a check of $500 from YakAttack! 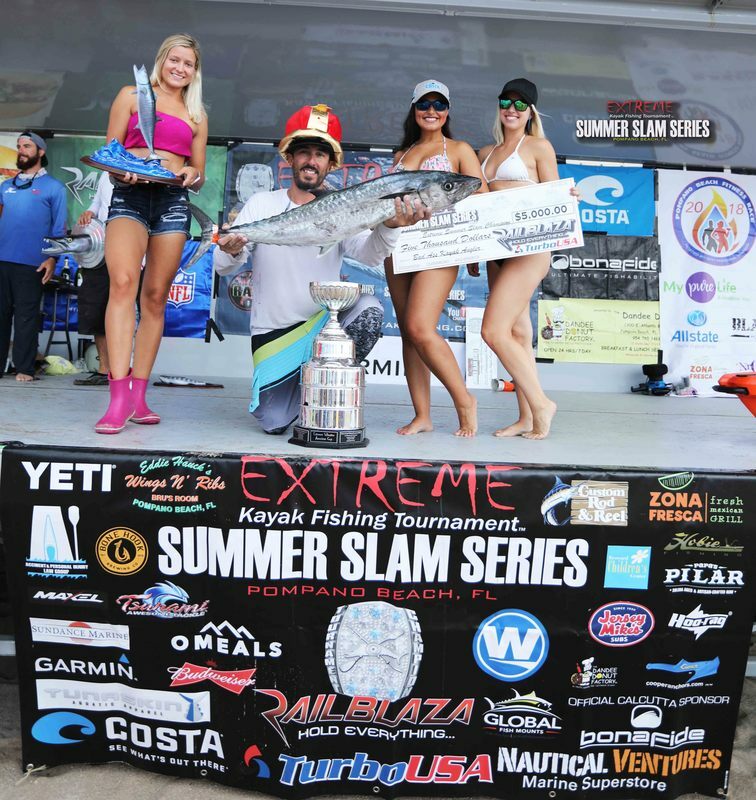 Second place goes to Joe Kraatz, he wins $1,500.00 from Nissan, Hobie Outback from Nautical Ventures & a plaque from Global Fish Mounts! 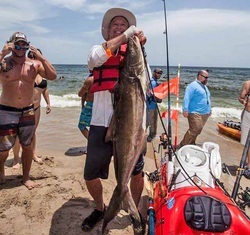 John Sims grabbed third place with the tournaments first Cobia winning a Hobie Revo from Nautical Ventures & $500.00 from Brus Room & COSTA Sun Glasses. 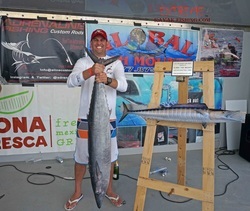 Carl Torresson wins fourth place netting a plaque from Global Fish Mounts, $200.00 from Turbo USA & COSTA Sun Glasses. 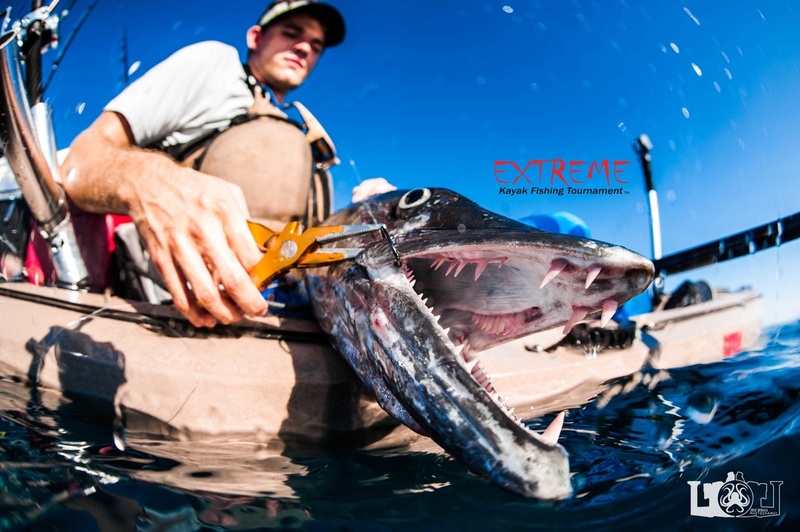 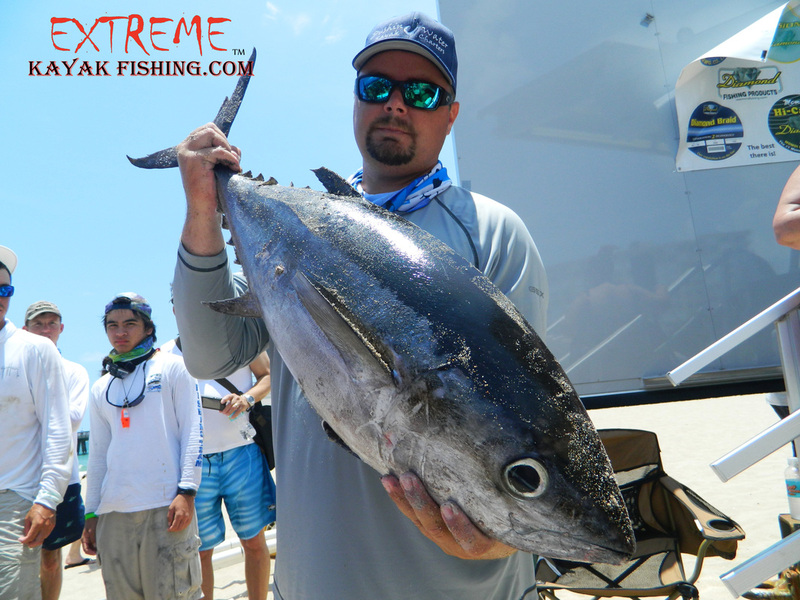 Wreck the Weight - Rob Rodriguez took this division winning a custom EXTREME rod made by Adrenaline Fishing Custom Rods. 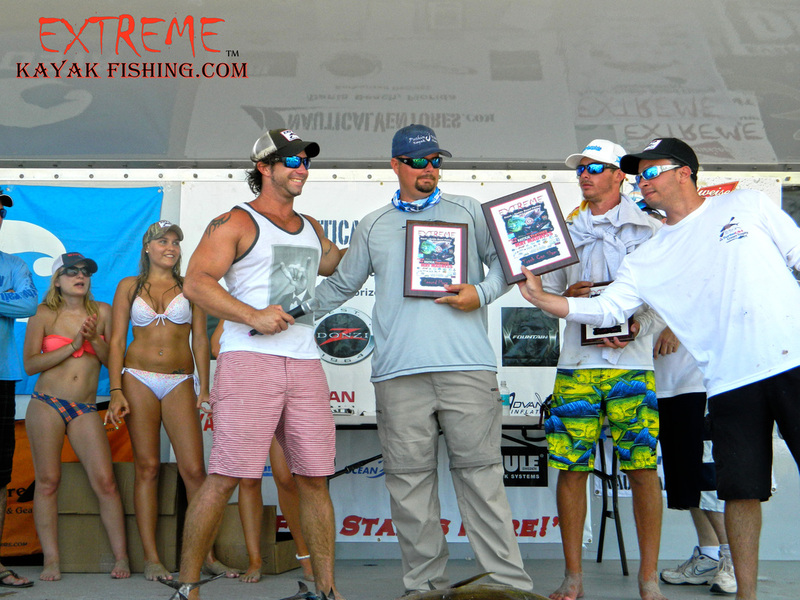 Brian Nelli wins first place with a total weight of 75.2lbs. 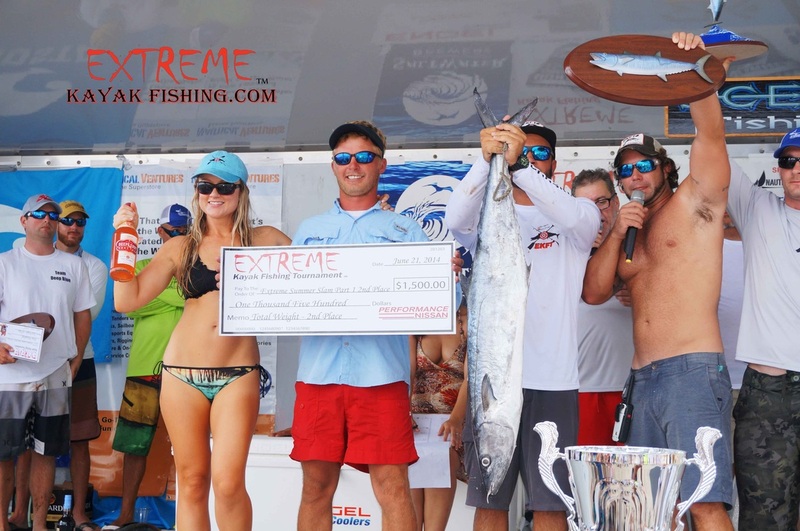 He takes home a check from Turbo USA of $5,000.00, Cup from Broward Plaque and Engraving & the coveted Extreme Ring! 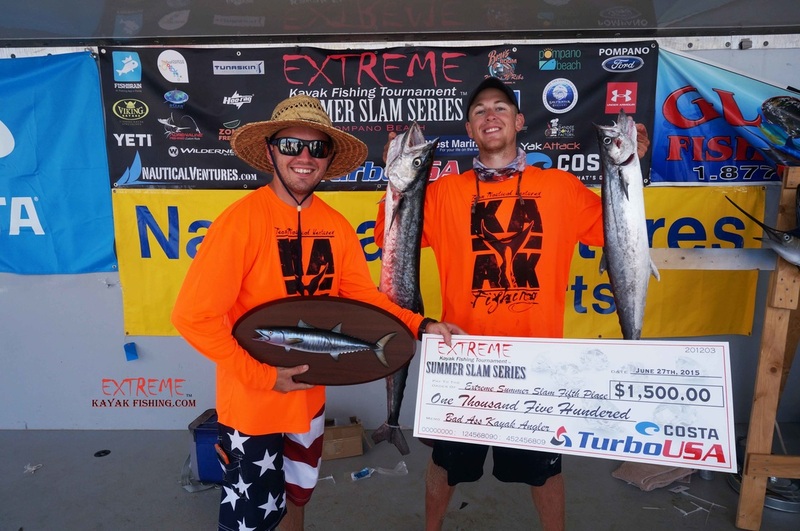 Nelli also took Trash Can Slam division winning lots of goodies from YakGear! 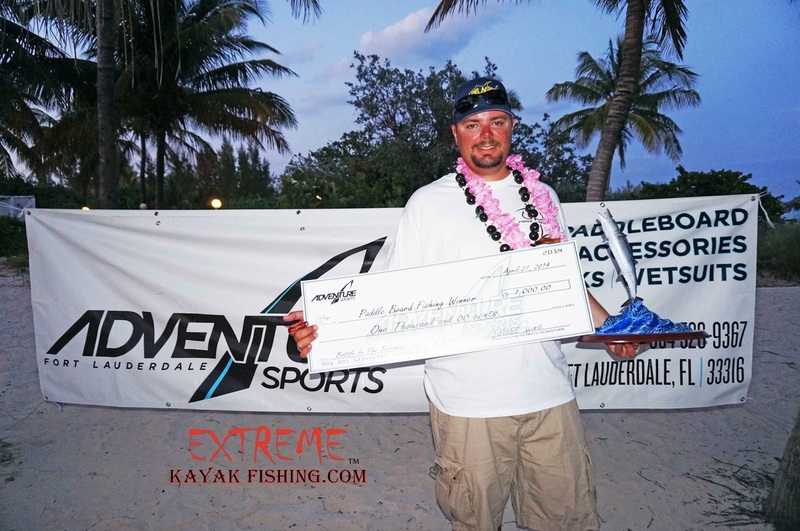 Don Miley nets second place getting his Hobie Outback donated by Nautical Ventures. 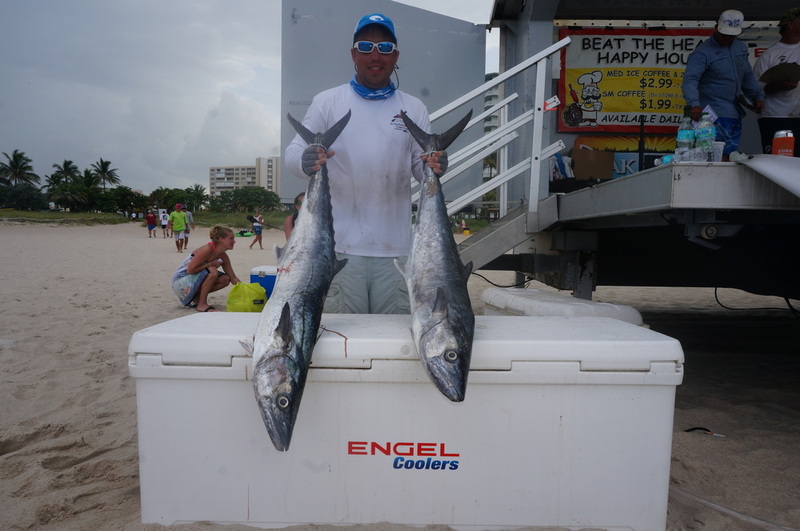 He also won a pair of Costa glasses & a custom plaque from Global Fish Mounts. 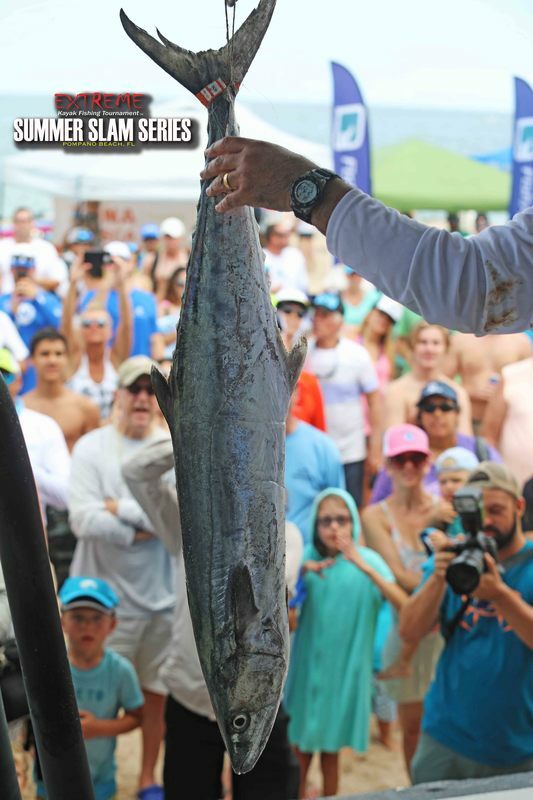 Total weight was 35.9lbs. 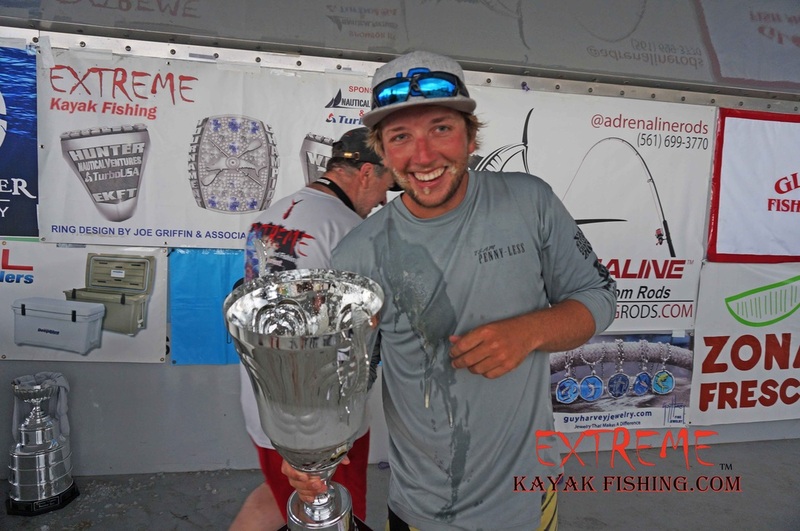 Drew Mixon wins third place winning a Hobie Revo & a pair of Costa Glasses. 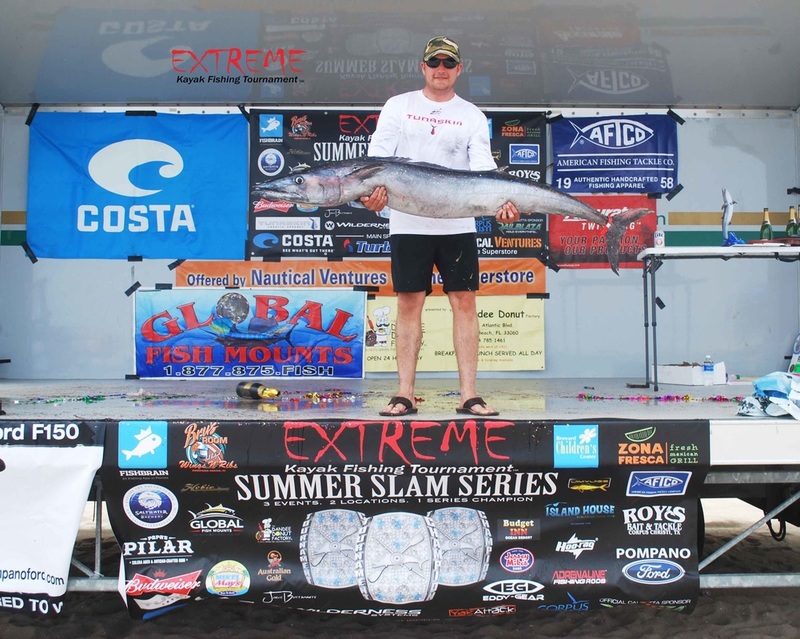 He also wins a custom plaque from Global Fish Mounts. 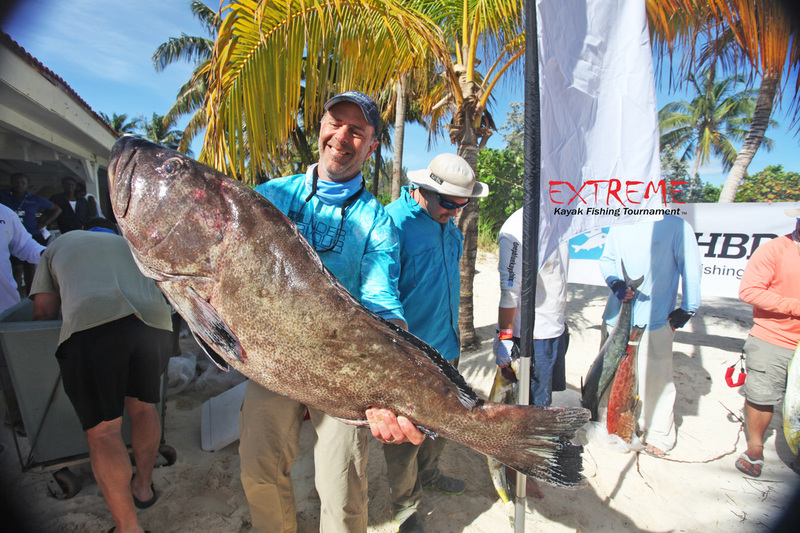 Total Weight 32.7lbs. 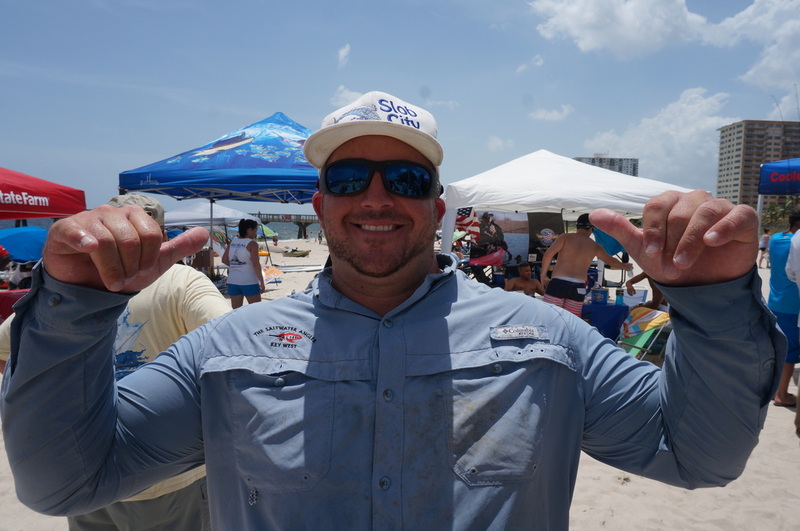 Joe Kraatz wins the billfish division landing the tournaments first White Marlin. 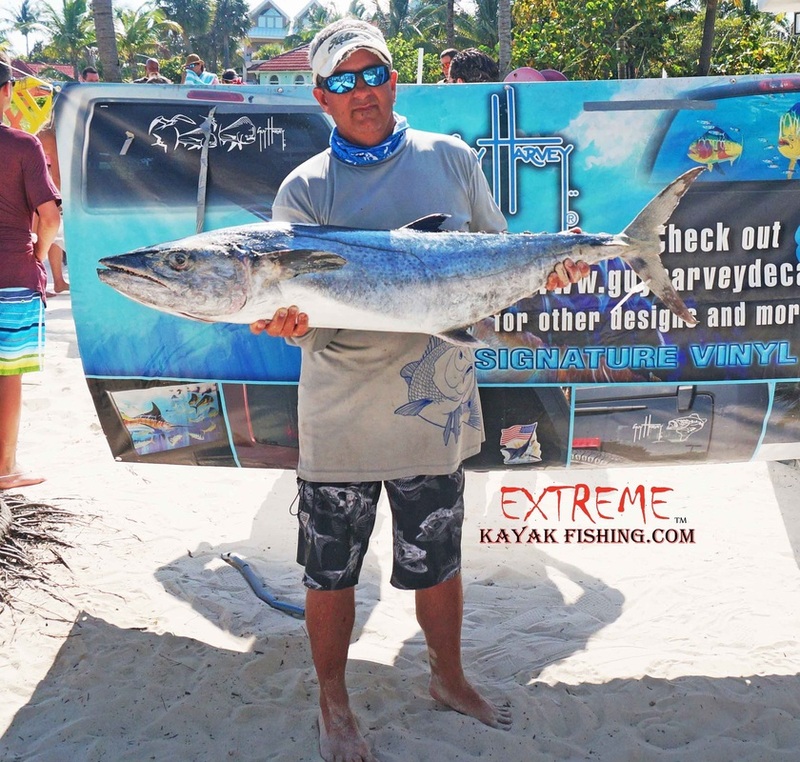 He wins a custom rod from from Blue Marlin Chronicles & a free entry to the Sailfish Smack Down 2015. 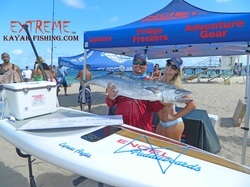 Brian Nelli takes the Biggest Pelagic Division winning $1000.00 & a paddle board from Adventure Sports Fort Lauderdale. 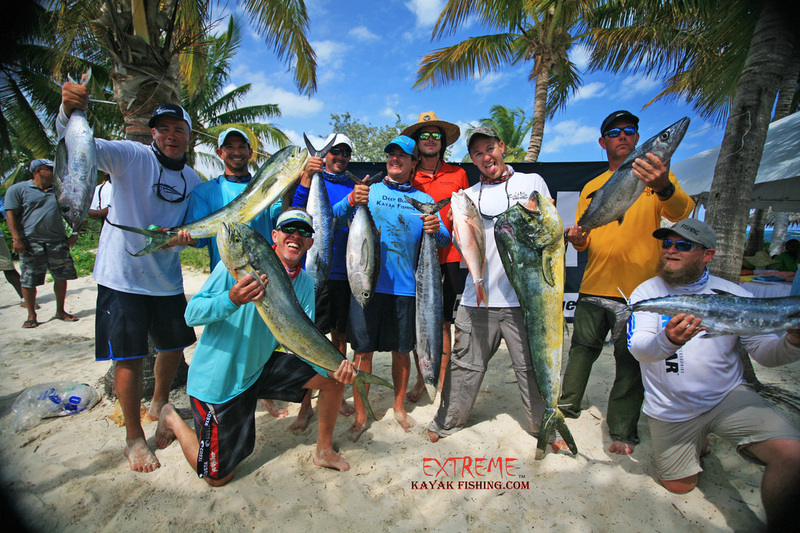 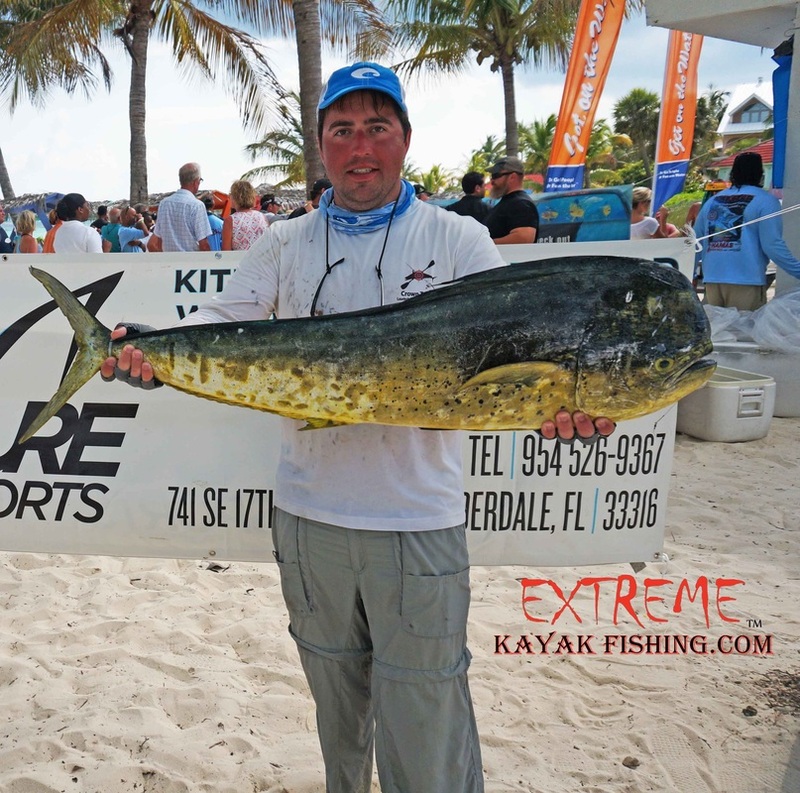 Joe Kraatz nets the biggest Mahi Mahi winning a custom Mahi plaque from Global Fish Mounts. 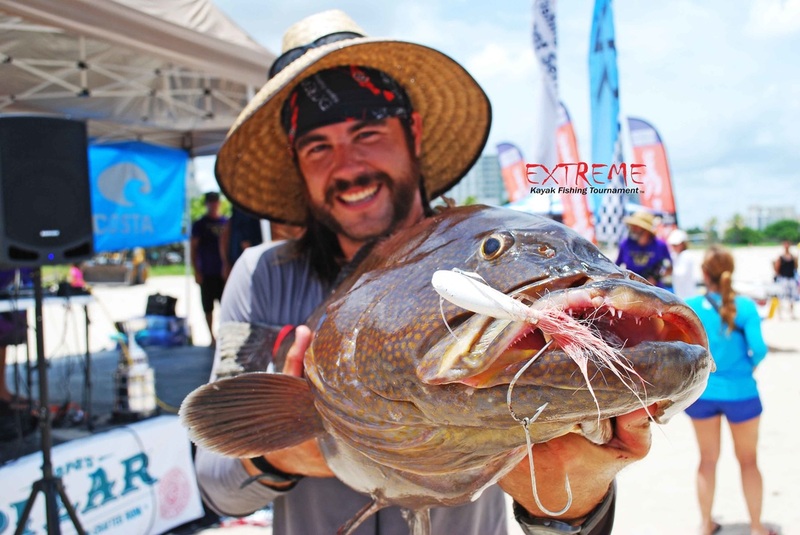 Deon Philipon caught the largest grouper of the Extreme series!! 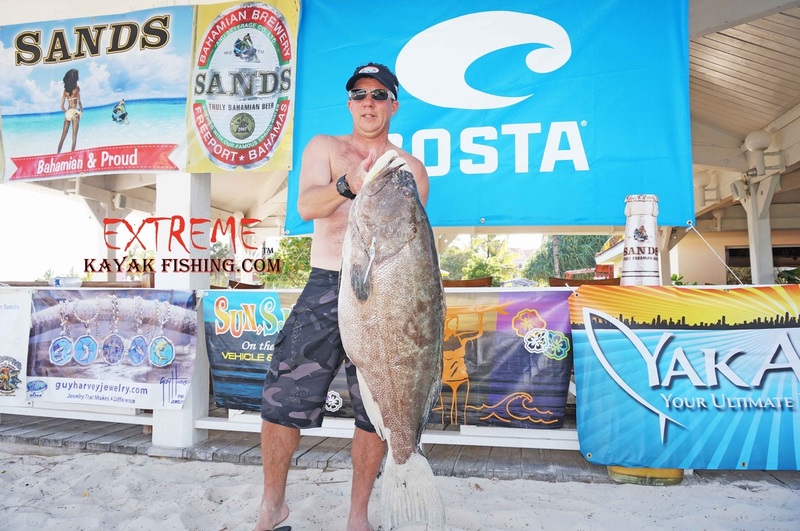 He hauled in a 32.3lb black grouper! 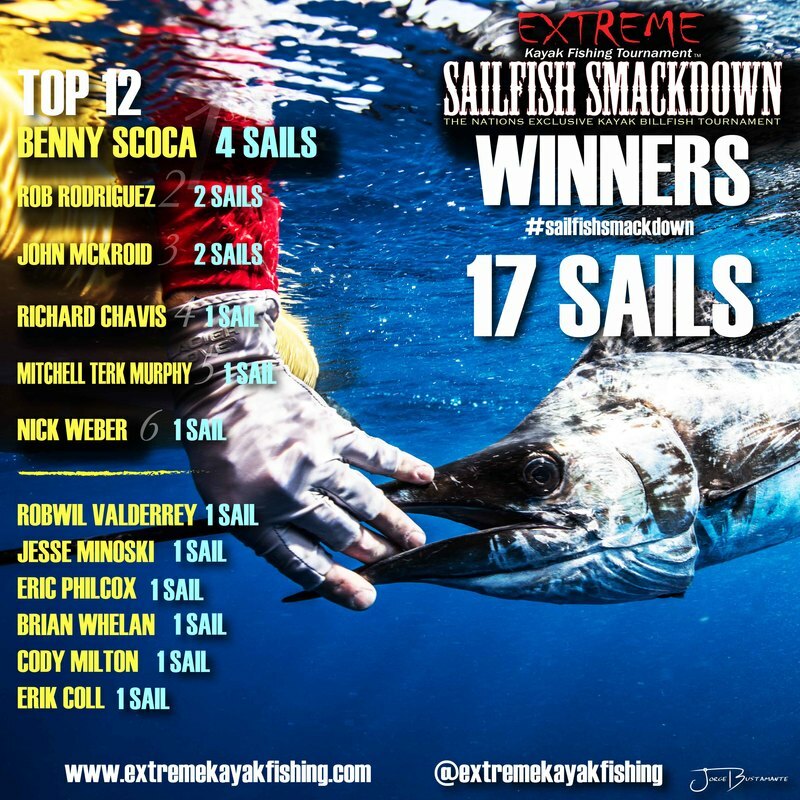 Big shout out to Marlin Matt (Matt Eckert) for fighting a Blue Marlin for about 11 hours and touching the leader. 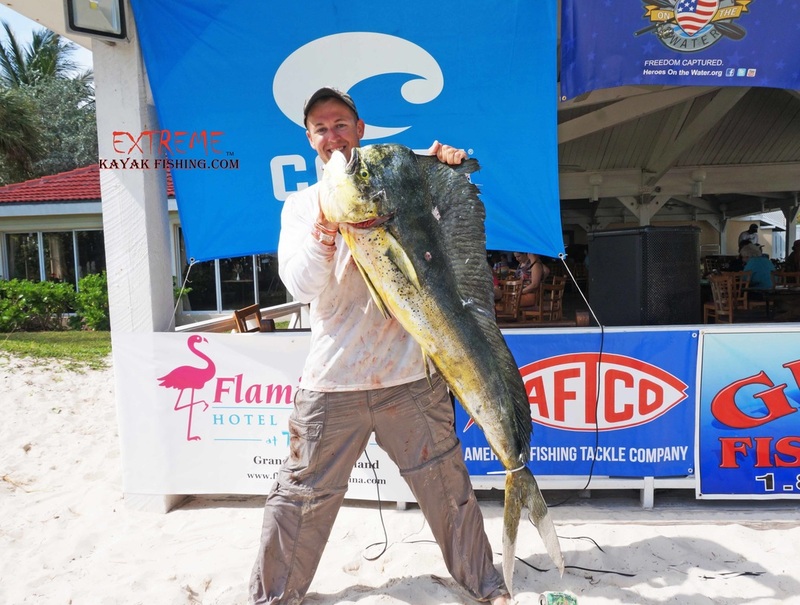 He got a free 4 day stay at Flamingo Bay Resort! 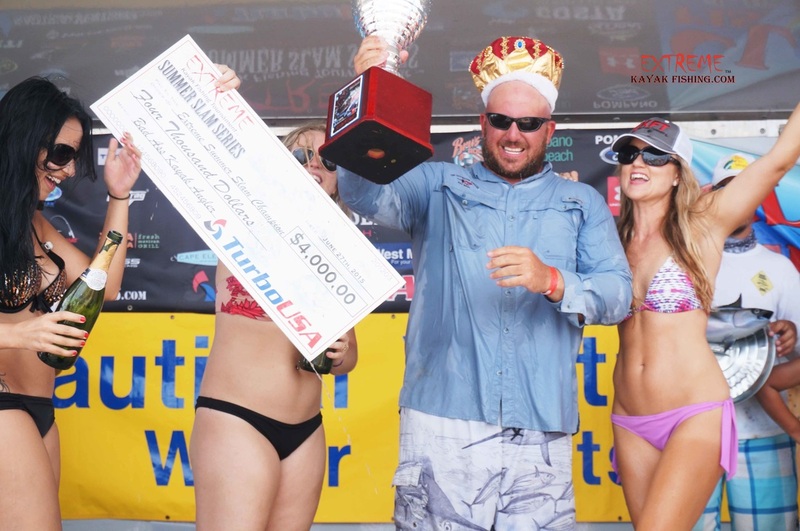 Brian Nelli wins first place receiving a fat check for $3000.00, COSTA Sun Glasses & the huge trophy from CROWN TROPHY!!! 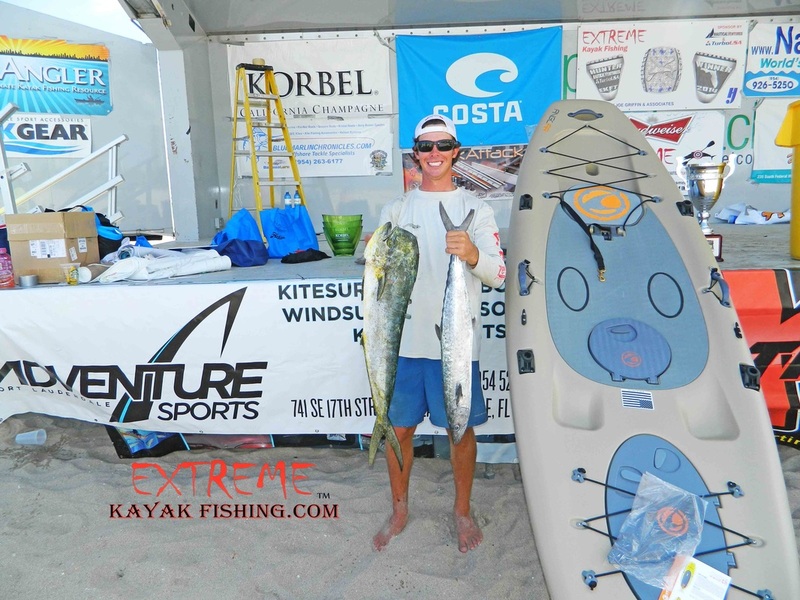 Joe Kraatz wins second place winning the Hobie Outback kayak from NAUTICAL VENTURES, COSTA Sun Glasses, $500 dollars & a plaque from CROWN TROPHY!! 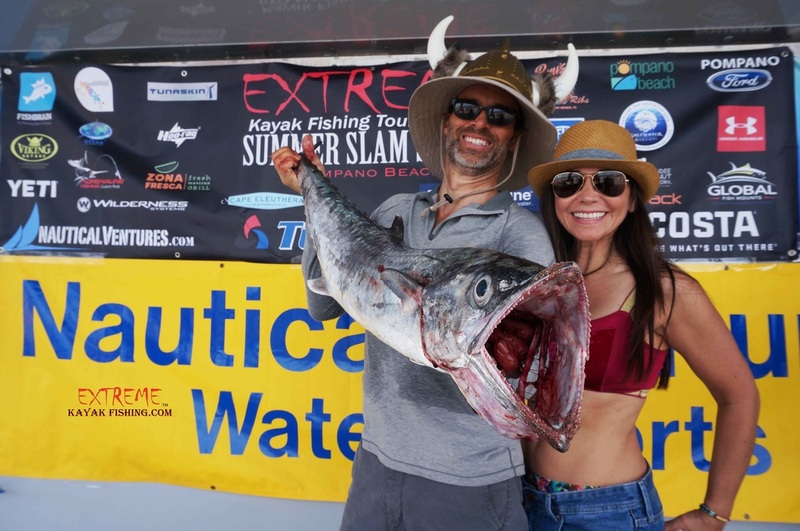 Rob Rodriguez wins third place taking home a Hobie Revo kayak from NAUTICAL VENTURES, COSTA Sun Glasses & a plaque by CROWN TROPHY!!! 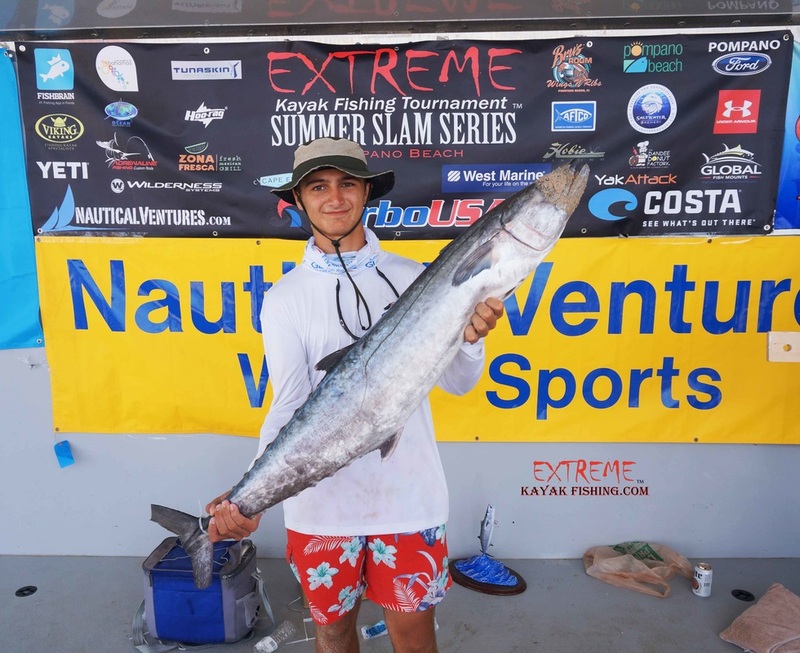 Austin Collins nets fourth place winning the Imagine Wizard Angler SUP Paddle Board from ADVENTURE SPORTS, PENN Spinfisher V ssv6500 Reel, Costa Sun glasses & Plaque from CROWN TROPHY!!! 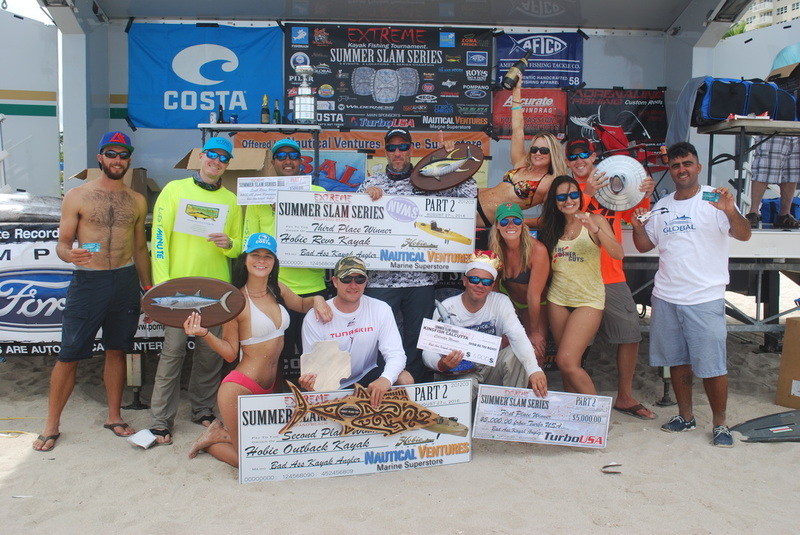 Andy Brown took fifth, winning COSTA Sun Glasses & a check for $200!!! 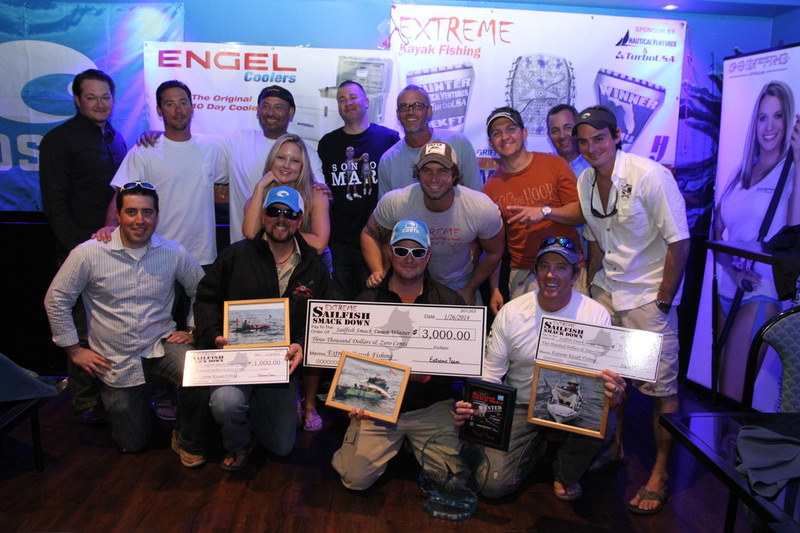 Brian Nelli not only wins Total Weight he wins Biggest Pelagic Division!! He takes home an ENGEL PADDLE BOARD worth $1599 donated from ENGEL COOLERS!!! 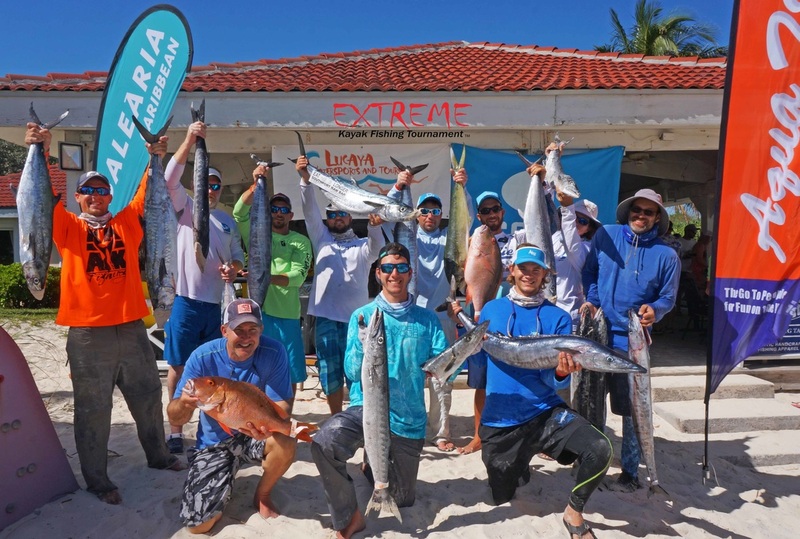 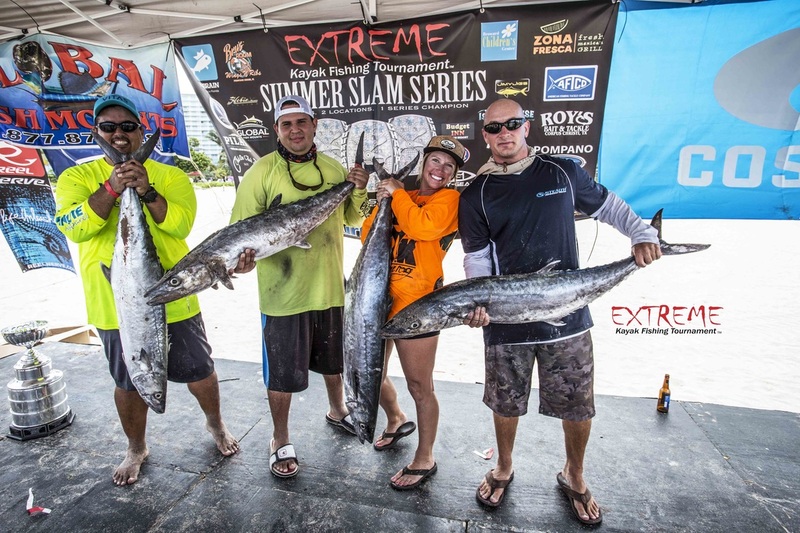 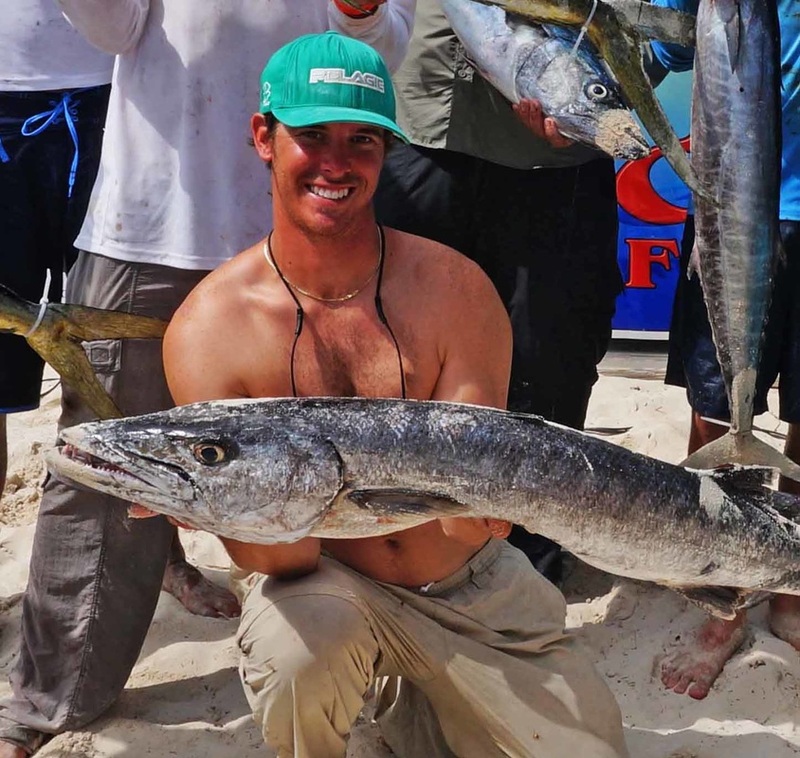 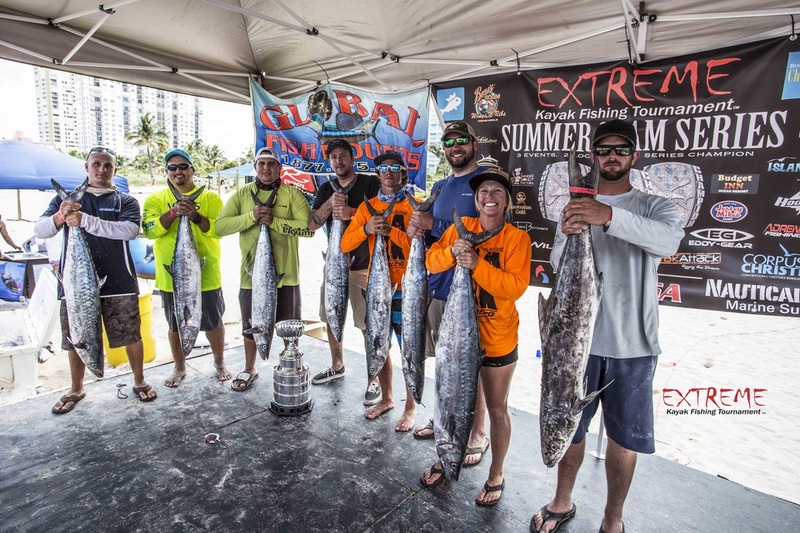 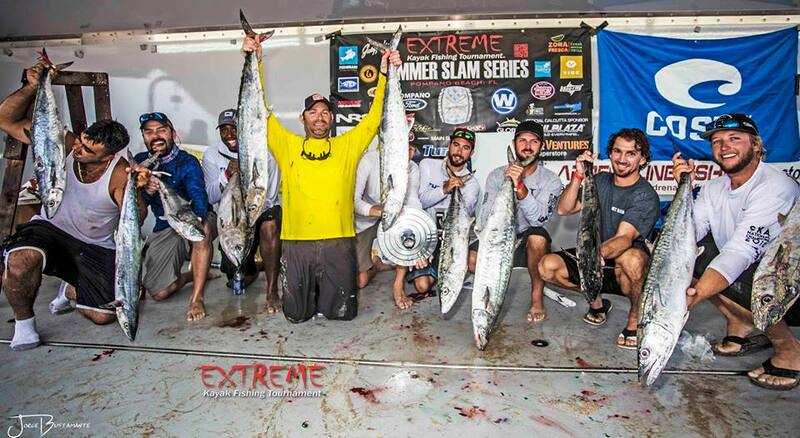 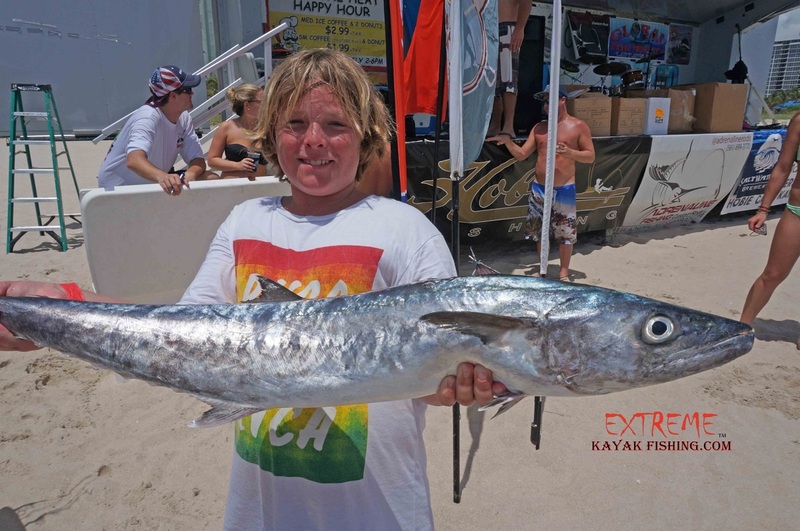 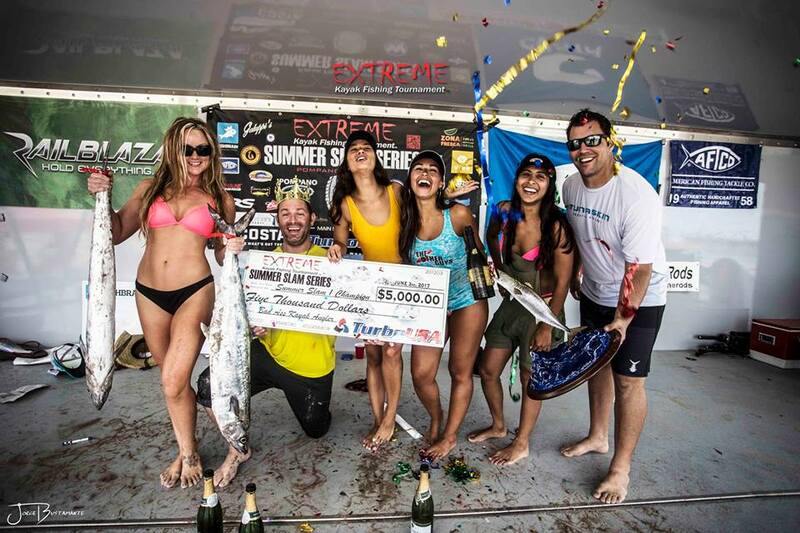 Brad Schwartz wins Trash Can Slam with a huge Barracuda. 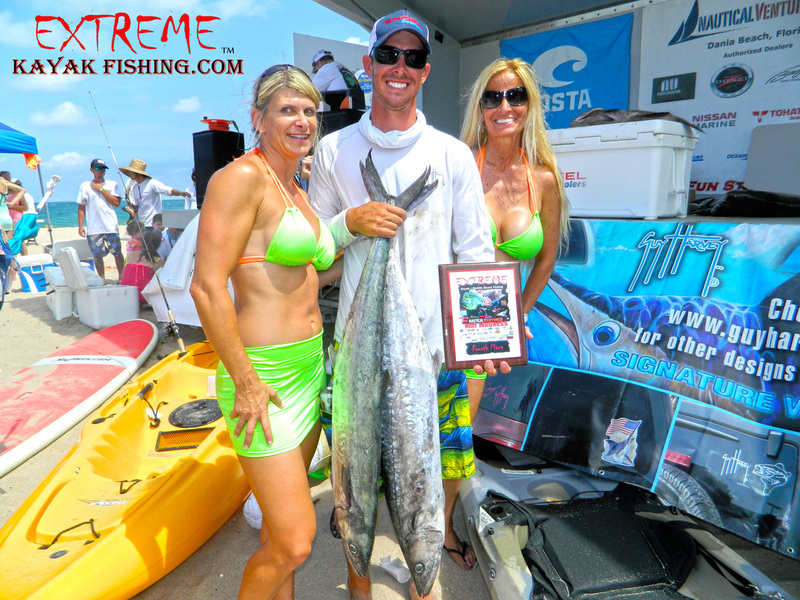 He takes home a pair of COSTA Sun Glasses & a plaque from CROWN TROPHY!!! 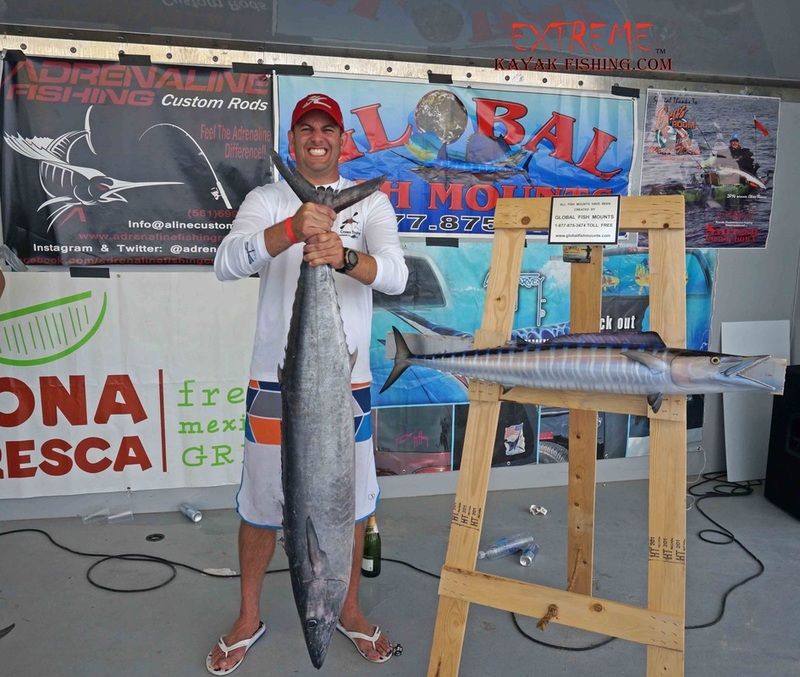 Brian Nelli also won the Trash Can Slam with a monster barracutta! 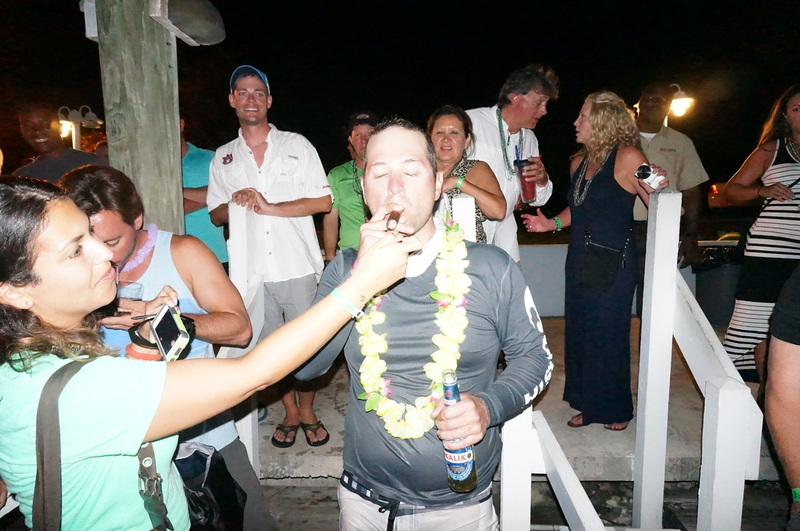 He wins a pair of Costa Sun Glasses & $100 Gift Card to Aruba Bach Cafe. 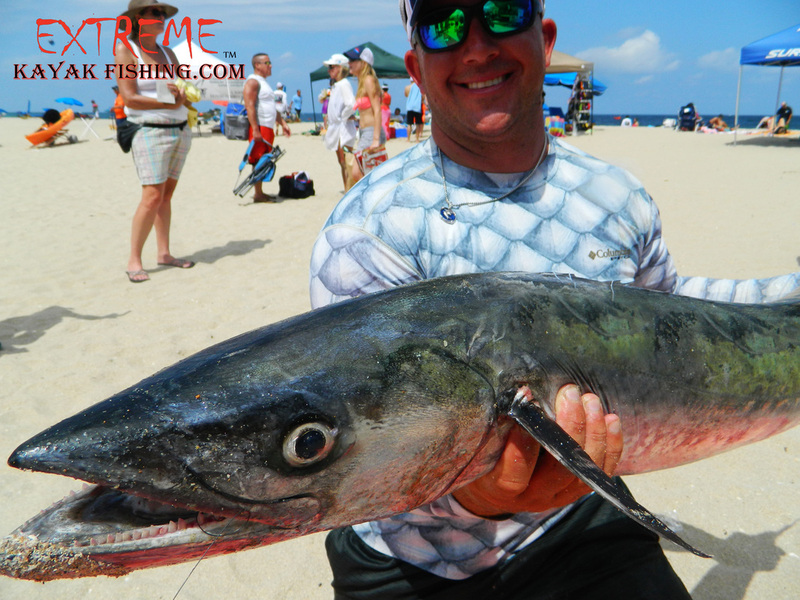 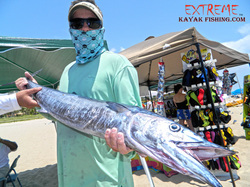 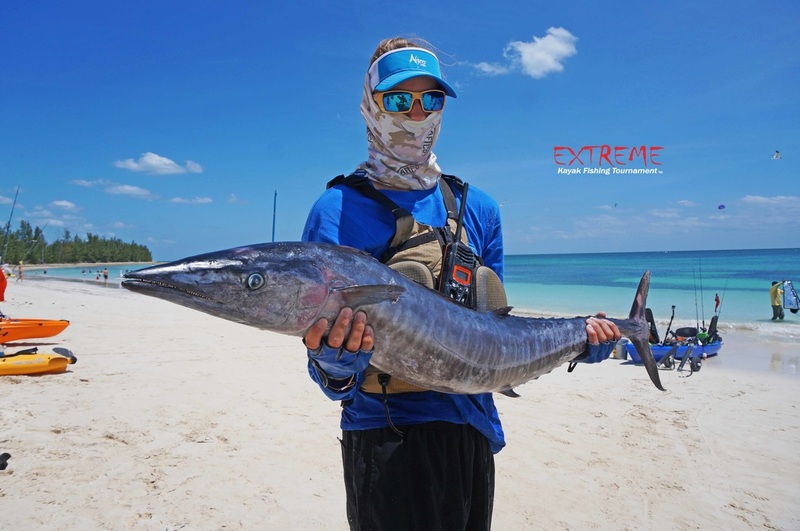 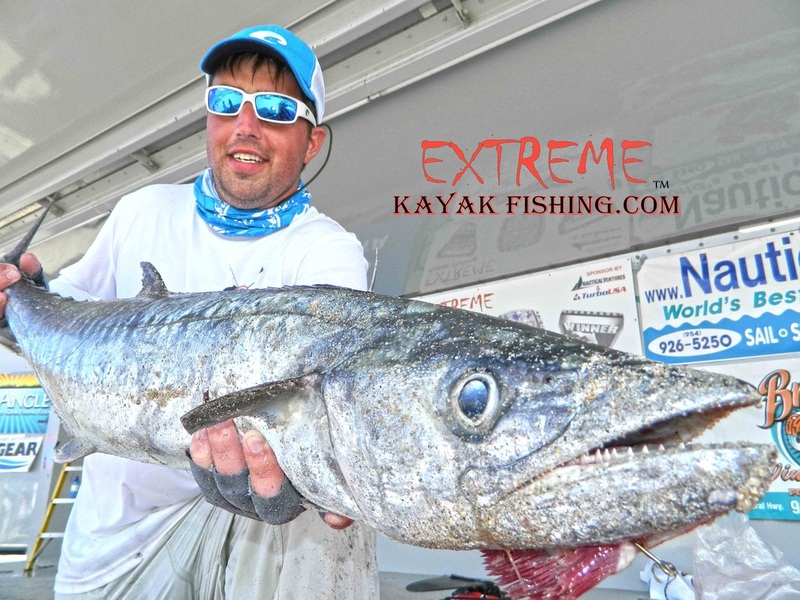 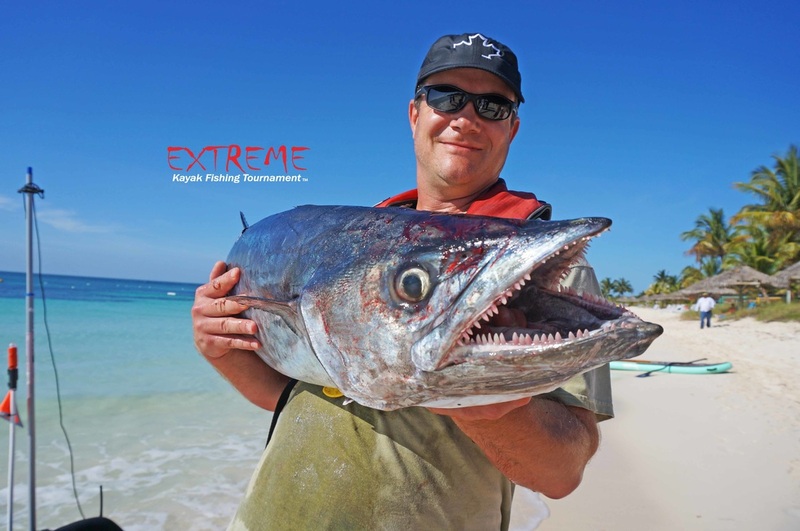 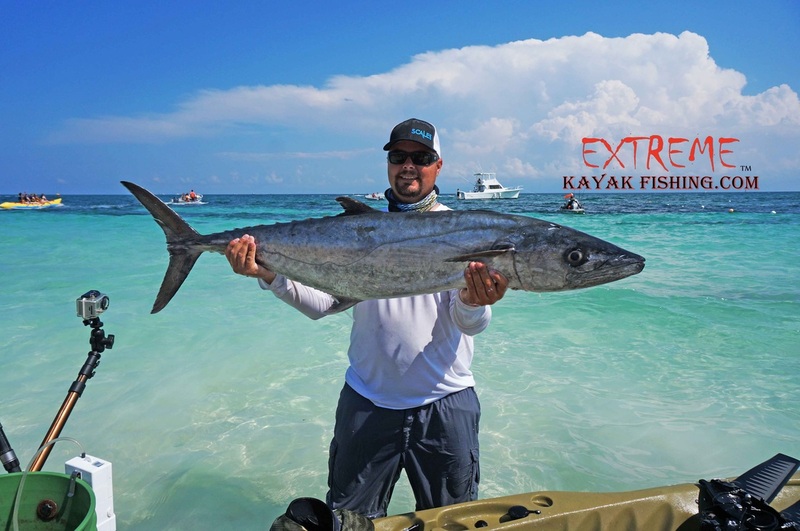 Andrew Mixon came to the beach with the first wahoo caught in the Extreme Kayak Fishing tourney series.. A wahoo is 50pts in the EKFT point system!! 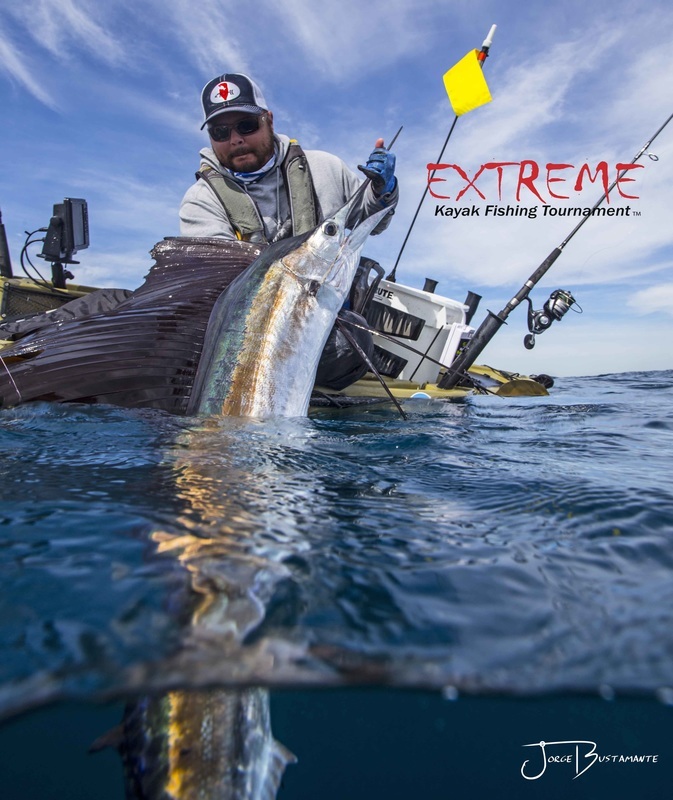 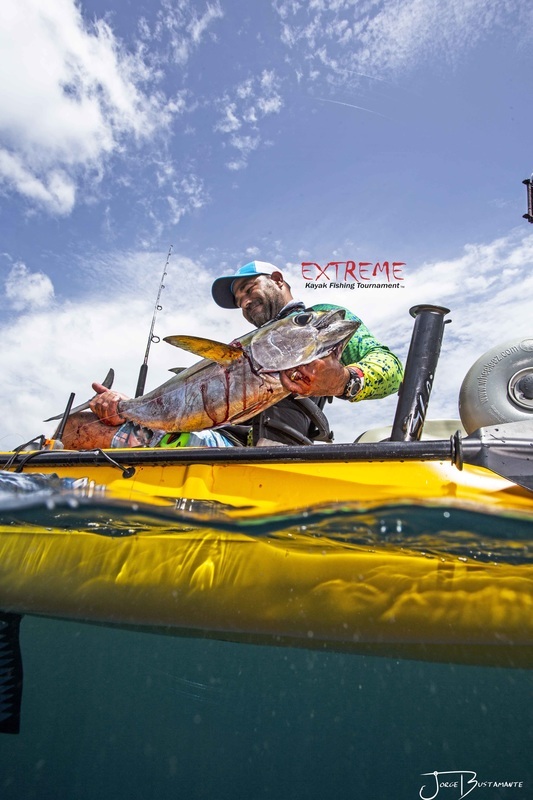 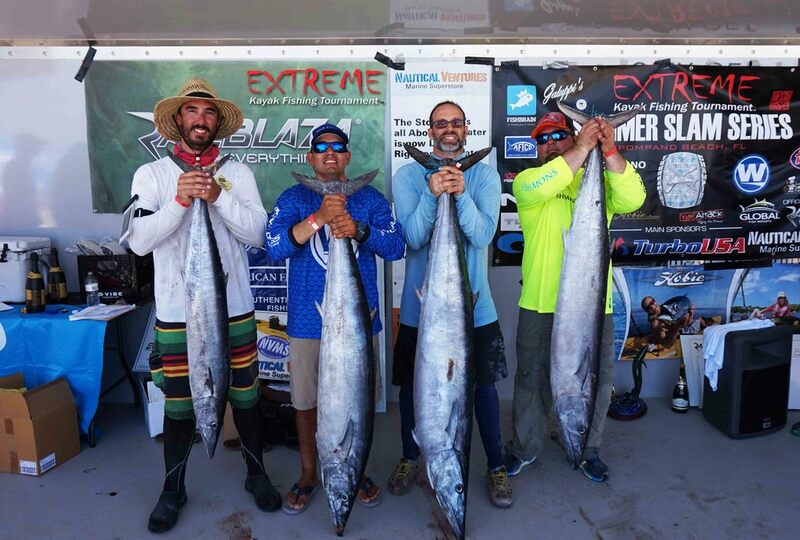 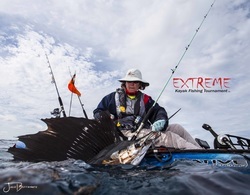 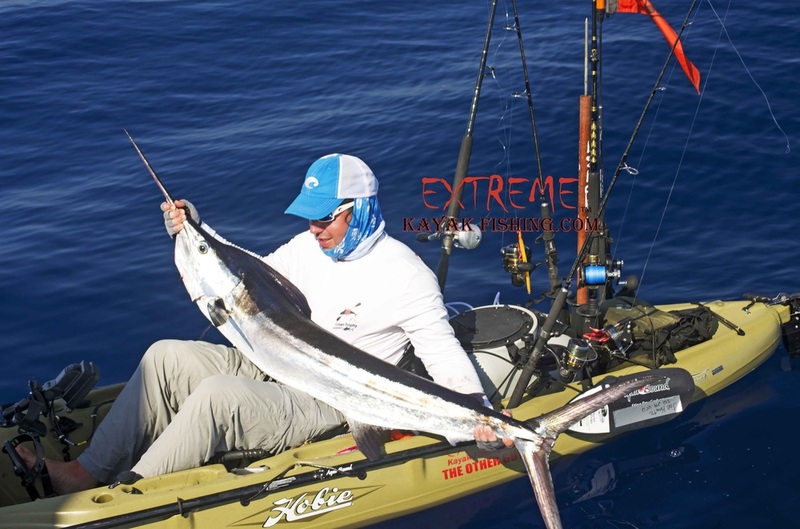 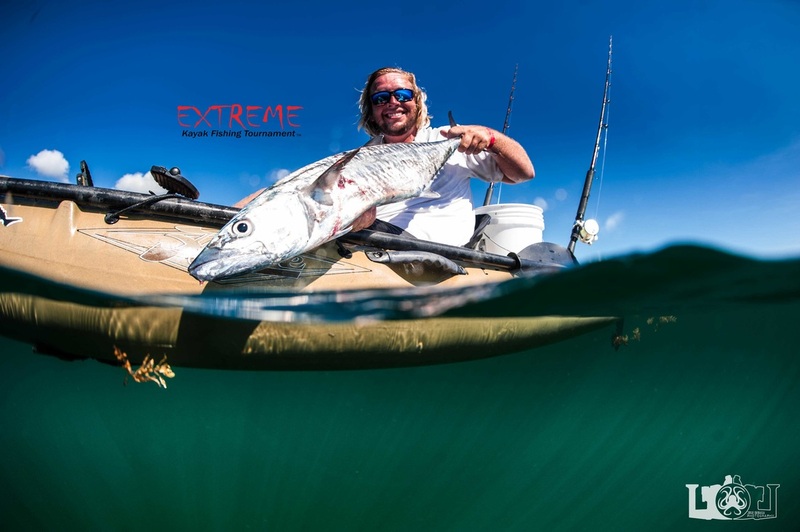 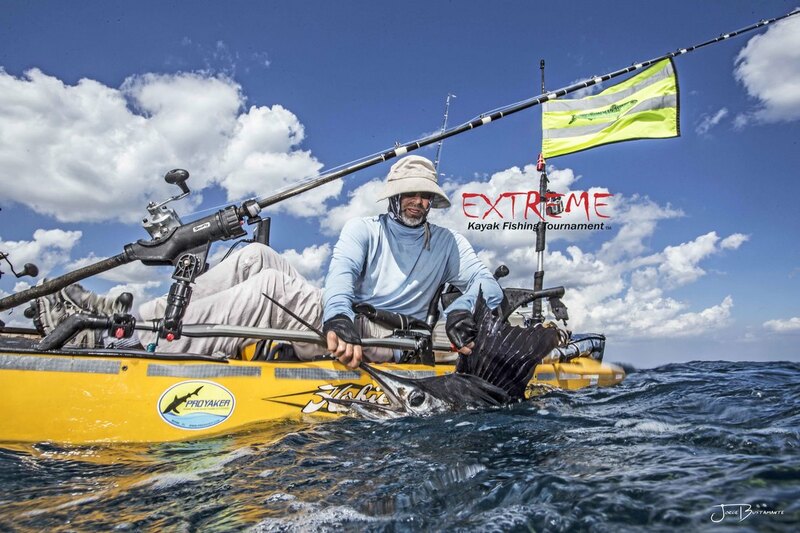 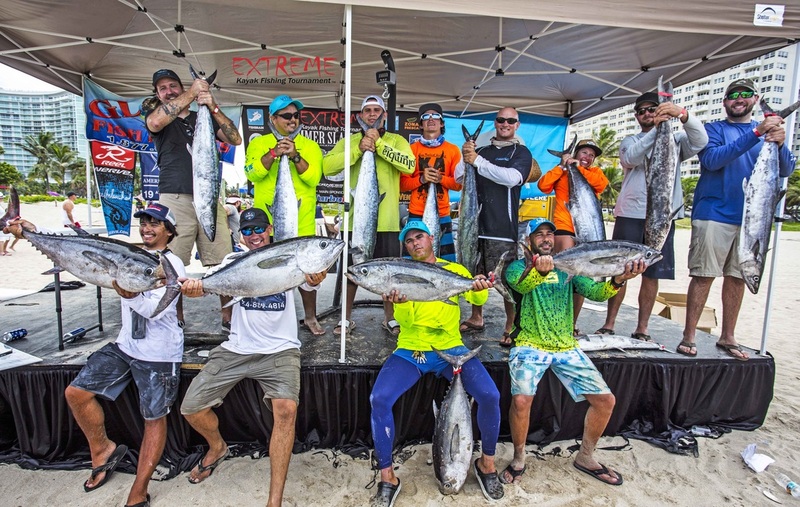 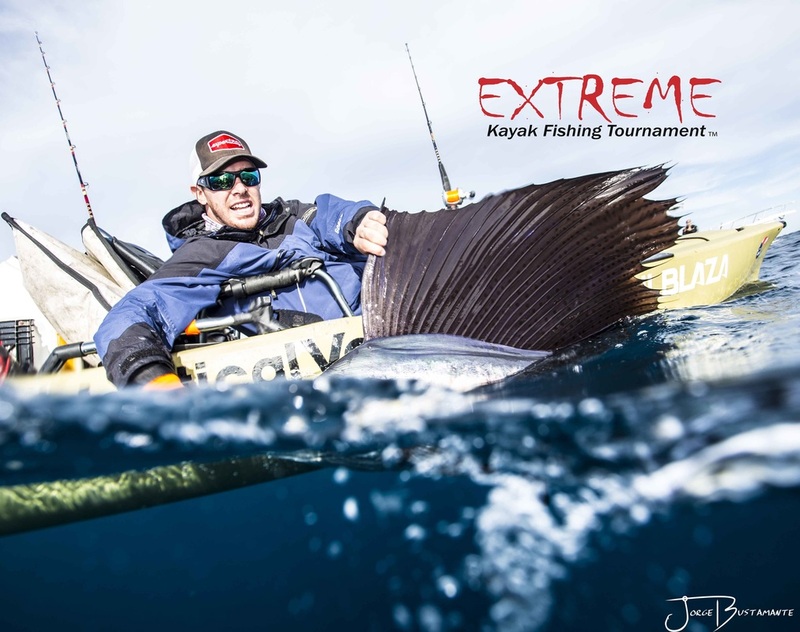 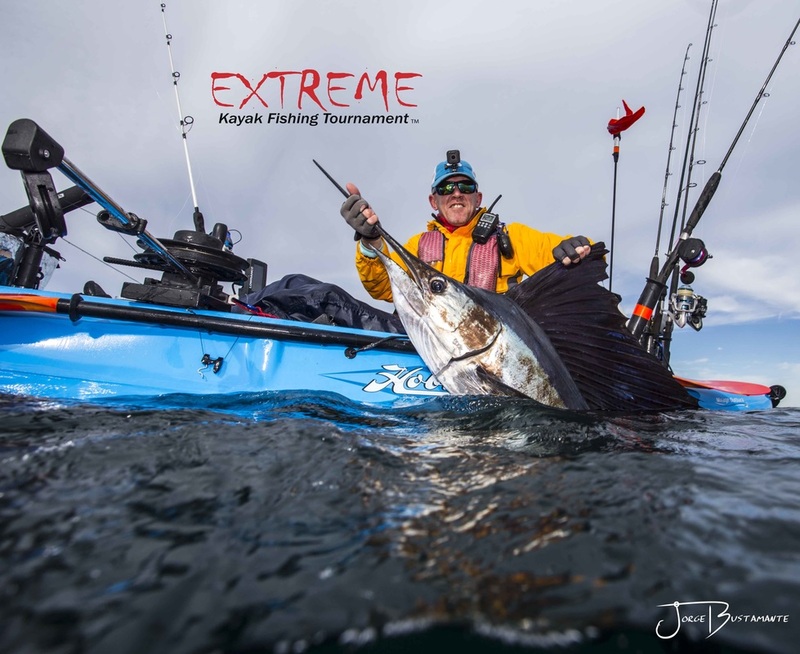 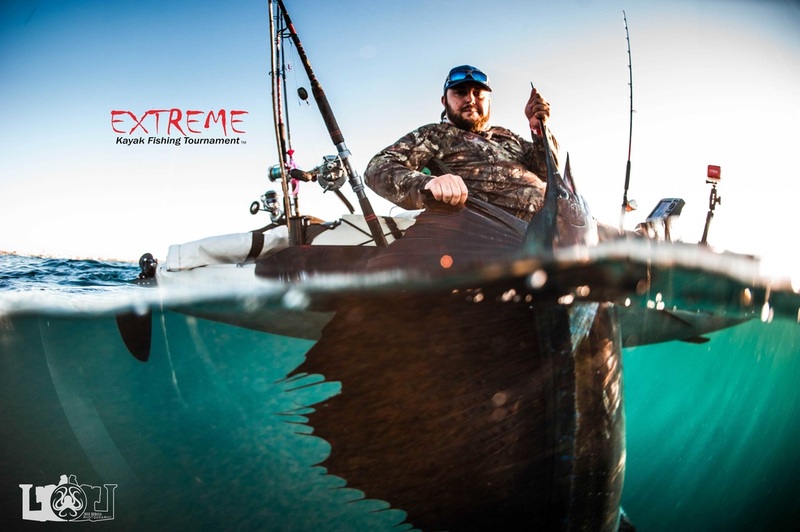 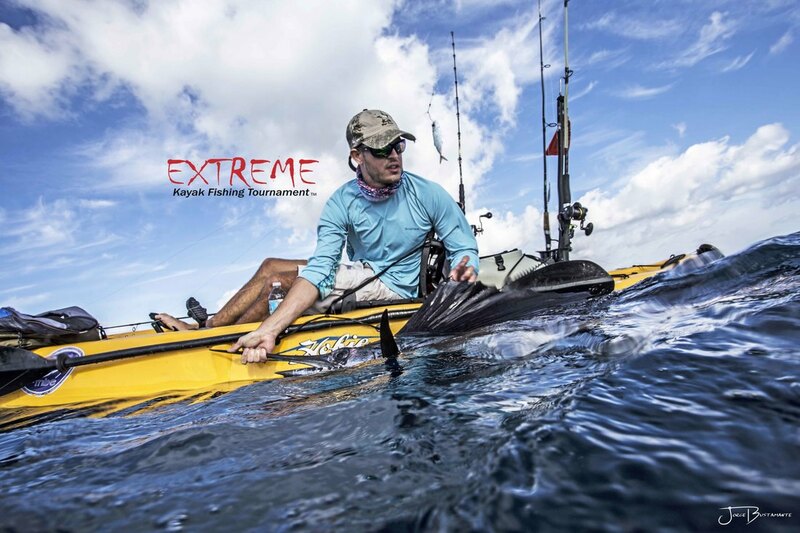 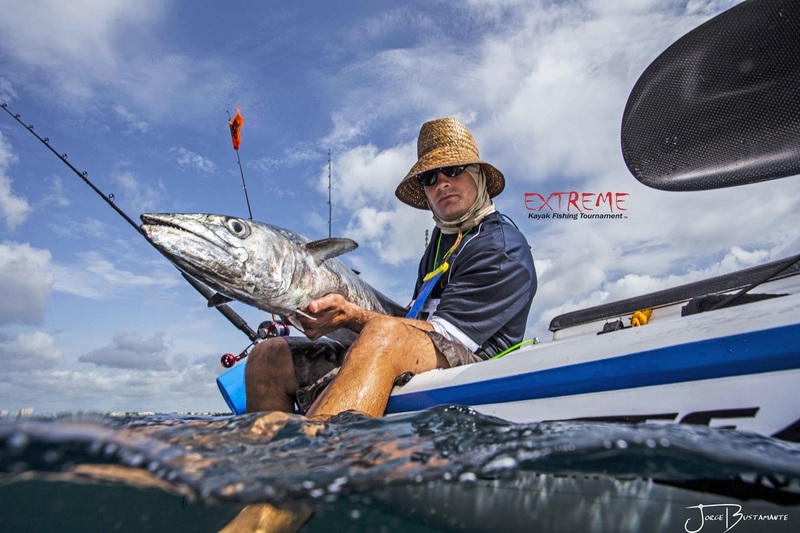 Winner of Biggest PELAGIC fish wins a SUP BOTE FISHING PADDLE BOARD. 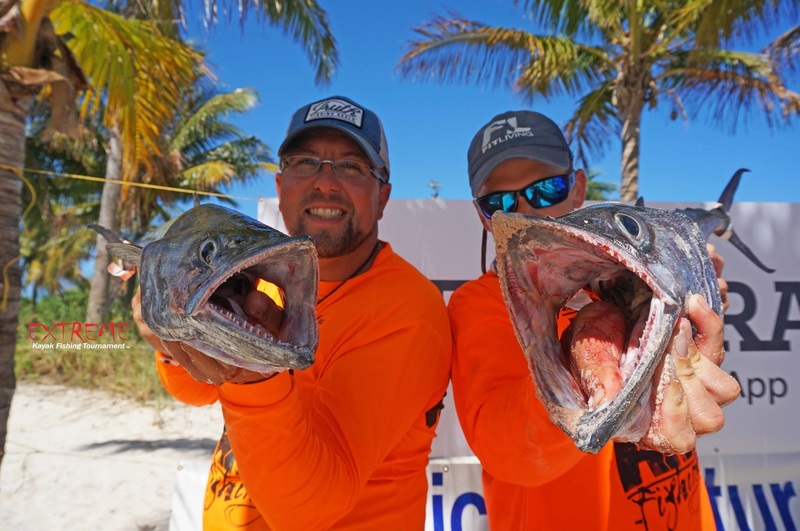 Guy Harvey Jewelry. 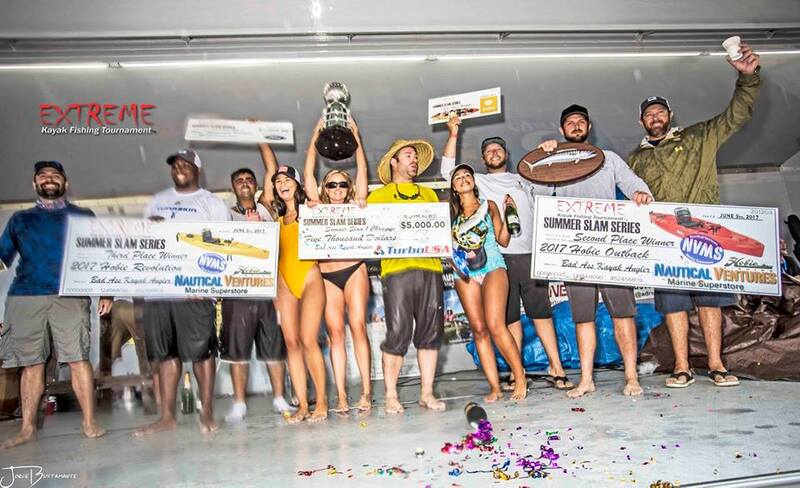 Winner of trash can slam won a pair of Costa Sun glasses, Knife set from West Marine & Plaque from Crown Trophy. 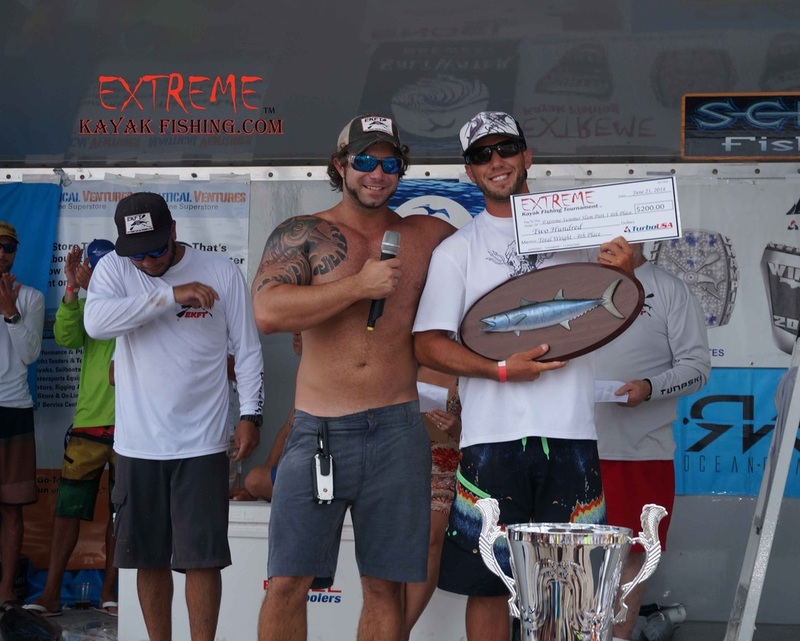 Devon won the Dolphin Calcutta, out of the 5 Dolphin caught.